First published 2014 by Guild of Master Craftsman Publications Ltd Castle Place, 166 High Street, Lewes, East Sussex BN7 1XU Text and designs © Vanessa Mooncie, 2014 Copyright in the Work © GMC Publications Ltd, 2014 All rights reserved The right of Vanessa Mooncie to be identified as the author of this work has been asserted in accordance with the Copyright, Designs and Patents Act 1988, sections 77 and 78. No part of this publication may be reproduced, stored in a retrieval system or transmitted in any form or by any means without the prior permission of the publisher and copyright owner. This book is sold subject to the condition that all designs are copyright and are not for commercial reproduction without the permission of the designer and copyright owner. introduction This book contains a collection of 15 crocheted animal-hat patterns in both children’s and adults’ sizes. The designs range from the monochrome striped zebra to the vibrantly coloured parrot, and from woodland creatures to safari animals. At the back of the book (page 140) you will ﬁnd instructions and tips on starting the projects as well as a guide to adding the ﬁnishing touches. There are two options for lining the hats to make them even cosier – you can choose between sewing a soft ﬂeece fabric lining or crocheting a lining. These animal hats are all crocheted in chunky yarn with the occasional feature – such as the rabbit’s nose or the leopard’s spots – worked in DK. This book will provide you with an array of cheerful headwear to make as a fun gift or to keep your own head warm and snuggly on a wintry day. leopard Keep warm in this wild-cat hat while making a fashion statement at the same time with the on-trend leopard print! This hat has generous earflaps to keep out the winter chill. TENSION 13 sts and 14 rows to 4in (10cm) over double crochet on 6mm hook. Use larger or smaller hook if necessary to obtain correct tension. METHOD The main part of the hat is crocheted in rounds, starting from the top and increasing the stitches to shape the crown. The earﬂaps are crocheted in rows and decreased to form the triangular shape. The leopard’s ears are worked in rounds. They are lightly stuffed and attached to the hat along with a crocheted nose and leopard spots. The number of spots can be increased to create a denser pattern, if preferred. Buttons are stitched on for eyes. Round 7 (inc): 1 ch (does not count as a st), (dc2inc, 5 dc) 6 times, sl st into ﬁrst dc (42 sts). Round 8 (inc): 1 ch (does not count as a st), (dc2inc, 6 dc) 6 times, sl st into ﬁrst dc (48 sts). Round 9 (inc): 1 ch (does not count as a st), (dc2inc, 7 dc) 6 times, sl st into ﬁrst dc (54 sts). Round 10 (inc): 1 ch (does not count as a st), (dc2inc, 8 dc) 6 times, sl st into ﬁrst dc (60 sts). Starting at the top of the hat, with 6mm hook and A, make 4 ch and sl st to ﬁrst ch to form a ring. Round 1: 1 ch (does not count as a st), work 6 dc into ring, sl st into ﬁrst dc (6 sts). Round 2 (inc): 1 ch (does not count as a st), (dc2inc) 6 times, sl st into ﬁrst dc (12 sts). Round 3 (inc): 1 ch (does not count as a st), (dc2inc, 1 dc) 6 times, sl st into ﬁrst dc (18 sts). Round 4 (inc): 1 ch (does not count as a st), (dc2inc, 2 dc) 6 times, sl st into ﬁrst dc (24 sts). Round 5 (inc): 1 ch (does not count as a st), (dc2inc, 3 dc) 6 times, sl st into ﬁrst dc (30 sts). Round 6 (inc): 1 ch (does not count as a st), (dc2inc, 4 dc) 6 times, sl st into ﬁrst dc (36 sts). Round 11 (inc): 1 ch (does not count as a st), (dc2inc, 9 dc) 6 times, sl st into ﬁrst dc (66 sts). Both sizes Next: 1 ch (does not count as a st), work 1 dc in each dc, sl st into ﬁrst dc. Rep last round 16  times more. First earﬂap Next: Starting at the centre back, 1 ch (does not count as a st), work 1 dc in next 5 dc. The following is worked in rows: Adult size only Row 1 (RS): Work 1 dc in next 15 dc, turn. Row 2 (WS) (dec): 1 ch (does not count as a st), dc2dec, 1 dc in next 11 dc, dc2dec, turn, 1 ch (does not count as a st). Both sizes Next: Work 1 dc in next 13 dc, turn. Next (dec): *1 ch (does not count as a st), dc2dec, 1 dc in next 9 dc, dc2dec, turn (11 sts). Next: 1 ch (does not count as a st), work 1 dc in each dc, turn. Next (dec): 1 ch (does not count as a st), dc2dec, 1 dc in next 7 dc, dc2dec, turn (9 sts). Next: 1 ch (does not count as a st), work 1 dc in each dc, turn. Next (dec): 1 ch (does not count as a st), dc2dec, 1 dc in next 5 dc, dc2dec, turn (7 sts). Next: 1 ch (does not count as a st), work 1 dc in each dc, turn. Next (dec): 1 ch (does not count as a st), dc2dec, 1 dc in next 3 dc, dc2dec, turn (5 sts). Next: 1 ch (does not count as a st), work 1 dc in each dc, turn. Next (dec): 1 ch (does not count as a st), dc2dec, 1 dc in next 1 dc, dc2dec, turn (3 sts). * Fasten off. Second earﬂap Next: With right side facing, rejoin A to the front of the hat. Work 1 dc in each of the 24 dc across the front of the hat. The following is worked in rows: Adult size only Row 1 (RS): Work 1 dc in next 15 dc, turn. Row 2 (WS) (dec): 1 ch (does not count as a st), dc2dec, 1 dc in next 11 dc, dc2dec, turn, 1 ch (does not count as a st). Both sizes Next: Work 1 dc in next 13 dc, turn. Next: Work from * to * of ﬁrst earﬂap. Fasten off. Omit if you plan to add a crocheted lining. Row 2 (dec): 1 ch (does not count as a st), dc2dec, 1 dc in next 11 dc, dc2dec, turn (13 sts). Row 3: 1 ch (does not count as a st), work 1 dc in each dc, turn. Using 5mm hook and A, with right side of work facing and starting at row 1 of the earﬂap facing, work 1 dc into each stitch down the edge of the next 10 rows, work dc2inc, 1 dc, dc2inc in the next 3 dc along the lower edge of the earﬂap facing, work 1 dc into each stitch at the edge of the next 10 rows up the other side of the earﬂap facing (25 sts). Fasten off, leaving a long length of yarn at the end. Both sizes Using 6mm hook and A, make 14 ch. Row 1 (RS): Work 1 dc in second ch from hook, 1 dc into the next 12 ch, turn (13 sts). Both sizes Next: Work from * to * of the ﬁrst earﬂap in the main piece pattern. Fasten off. Starting at the top of the ear, with 6mm hook and A, make 4 ch and sl st to ﬁrst ch to form a ring. Round 1: 1 ch (does not count as a st), work 5 dc into ring, sl st into ﬁrst dc (5 sts). Round 2 (inc): 1 ch (does not count as a st), (dc2inc) 5 times, sl st into ﬁrst dc (10 sts). Round 3 (inc): 1 ch (does not count as a st), (dc2inc, 1 dc) 5 times, sl st into ﬁrst dc (15 sts). Round 4 (inc): 1 ch (does not count as a st), (dc2inc, 2 dc) 5 times, sl st into ﬁrst dc (20 sts). Adult size only Next (inc): 1 ch (does not count as a st), (dc2inc, 4 dc) 4 times, sl st into ﬁrst dc (24 sts). Both sizes Next: 1 ch (does not count as a st), work 1 dc in each dc, sl st into ﬁrst dc. Rep last round 4 more times. Fasten off, leaving a long length of yarn at the end. NOSE Both sizes With 3mm hook and B, make 4 ch and sl st to ﬁrst ch to form a ring. Next: 1 ch (does not count as a st), work 6 dc into ring, sl st into ﬁrst dc (6 sts). Child size only Next round: 1 ch (does not count as a st), work 1 dc in each dc, sl st to ﬁrst dc. Next round (inc): 1 ch (does not count as a st), (dc2inc) 6 times, sl st into ﬁrst dc (12 sts). Next round (inc): 1 ch (does not count as a st), (dc2inc) 12 times, sl st into ﬁrst dc (24 sts). Adult size only Next (inc): 1 ch (does not count as a st), (dc2inc) 6 times, sl st into ﬁrst dc (12 sts). Next round: 1 ch (does not count as a st), work 1 dc in each dc, sl st to ﬁrst dc. Next round: Rep last round. Next round (inc): 1 ch (does not count as a st), (dc2inc) 12 times, sl st into ﬁrst dc (24 sts). Next round: 1 ch (does not count as a st), (dc2inc, 2 dc) 8 times, sl st into ﬁrst dc (32 sts). Both sizes Fasten off, leaving a long length of yarn at the end. SPOTS Tiny (make 10) With 3mm hook and C, make 4 ch and sl st to ﬁrst ch to form a ring. Round 1: 1 ch (does not count as a st), work 5 dc into ring, sl st into ﬁrst dc (5 sts). Join in yarn B. Round 2 (inc): With B, make 1 ch (does not count as a st), (dc2inc) 5 times (10 sts). Fasten off, leaving a long length of B at the end. With 3mm hook and C, make 4 ch and sl st to ﬁrst ch to form a ring. Round 1: 1 ch (does not count as a st), work 5 dc into ring, sl st into ﬁrst dc (5 sts). Round 2 (inc): 1 ch (does not count as a st), (dc2inc) 5 times, sl st into ﬁrst dc (10 sts). Round 3 (inc): 1 ch (does not count as a st), (dc2inc, 1dc) twice, join and continue in yarn B, (dc2inc, 1dc) 3 times, sl st into ﬁrst dc (15 sts). Round 4 (inc): With B, 1 ch (does not count as a st), (dc2inc, 2dc) 4 times, sl st to next dc. Fasten off, leaving a long length of B at the end. With 3mm hook and C, make 4 ch and sl st to ﬁrst ch to form a ring. Round 1: 1 ch (does not count as a st), work 6 dc into ring, sl st into ﬁrst dc (6 sts). Round 2 (inc): 1 ch (does not count as a st), (dc2inc) 6 times, sl st into ﬁrst dc (12 sts). Join in yarn B. Round 3 (inc): With B, make 1 ch (does not count as a st), (dc2inc, 1dc) 6 times, turn (18 sts). Next: With B, miss ﬁrst dc, 1 dc in next 2 dc, (dc2inc, 2dc) 3 times, sl st to next dc. Fasten off, leaving a long length of B at the end. With 3mm hook and C, make 4 ch and sl st to ﬁrst ch to form a ring. Row 1: 1 ch (does not count as a st), work 6 dc into ring, turn (6 sts). Row 2 (inc): 1 ch (does not count as a st), (dc2inc) 3 times, join and continue in yarn B, (dc2inc) 3 times, turn (12 sts). Row 3 (inc): With B, 1 ch (does not count as a st), (dc2inc, 1dc) 6 times (18 sts). Fasten off, leaving a long length of B at the end. MAKING UP Edging With right side of work facing, using 5mm hook and A, rejoin yarn to the back of the hat by the second earﬂap. Next: Work 1 dc in each of the 10 dc across the back of the hat, work 1 dc into each stitch down the edge of the next 9 rows of the ﬁrst earﬂap, **working in the next 3 dc along the lower edge of the earﬂap, dc2inc, 1 dc, dc2inc, work 1 dc into each stitch at the edge of the next 9 rows up the other side of the earﬂap**, work 1 dc into each of the next 24 dc across the front of the hat, work 1 dc into each stitch down the edge of the next 9 rows of the second earﬂap, rep from ** to ** to ﬁnish the edging on the second earﬂap, sl st to ﬁrst dc (80 sts). If making a crocheted lining, fasten off and miss out the next round of edging. Next: 1 ch (does not count as a st), work 1 dc in each of the 10 dc across the back of the hat, ***with wrong sides together, working into the stitches of the earﬂap and earﬂap facing at the same time to join, miss the ﬁrst dc of the earﬂap facing and work 1 dc into each of the next 10 dc, dc2inc, 1 dc into next dc, dc2inc, 1 dc into each of the next 10 dc, miss the last dc of the earﬂap facing***, work 1 dc into each of the next 24 dc across the front of the hat, rep from *** to *** to ﬁnish the edging on the second earﬂap (84 sts). Sl st to next st and fasten off. Using a darning or tapestry needle and the long length of A left after fastening off, slip stitch the top edge of the earﬂap facings to the inside of the main piece. Ears Stuff the ears lightly, keeping a ﬂattened shape. With the long length of yarn left, sew the stitches from each side of the last round together to join, forming a straight edge. Bring each corner at the lower edge to the middle to shape the ear and stitch together. Sew in place to each side of the head, stitching all around the lower edges to prevent them from ﬂopping over. Finishing touches If making a crocheted lining, attach the twisted cords to the hat after inserting the lining. Weave in all the yarn ends. Make two twisted cords (see page 154) using A, each measuring 8in (20cm) long, using 6 strands of yarn. Make two 2[2⅜]in (5cm) pompoms (see page 155) in A and attach each to one end of the twisted cord, then stitch the other end of the cord to the tip of the earﬂap. LINING See pages 142–5 for how to make and attach a cosy ﬂeece or crocheted lining. Nose Flatten the nose and sew the 12 stitches from each side of the top edge together. With the stitched edge at the top, sew the nose to centre front of hat, around ⅝in (1.5cm) from the lower edge. Eyes and spots Place the small black buttons over the larger brown buttons and sew in place for the eyes. Position the spots over the front and back of the hat. They can be used with either side facing up so you can create a symmetrical leopard print pattern with them or scatter them randomly. Stitch them in place using the long length of yarn left at the end. frog This beanie-style hat features a turned-back brim in a ribbed-effect pattern, and is topped by a huge pair of bulbous eyes. Itâ&#x20AC;&#x2122;s the perfect hat if you want to stand out from the crowd! TENSION 13 sts and 14 rows to 4in (10cm) over double crochet on 5.5mm hook. Use larger or smaller hook if necessary to obtain correct tension. This p pattern attern start starts ts wi with t tthe th h brim, he m which is wor rke ked d in rows of dou ubl ble e cr ccrochet, och oc het, worked double insertin in the ho ing ookk into the back ck loop only inserting hook of each h st tittch to produce the rrib ib effect. stitch The shortt ed e ges are joined tto o form a edges ring, and the e piece is turned d on its side to ﬁnish the band ban nd of ribbing. rib ibbing ng. The ng The main part of the hat is in i roundss of double crochet, with the ﬁrst s round off stitches worked st evenly around the edge of the ribbing. The shaping of the crown is formed by decreasing the stitches. The eyes are in rounds of double crochet and are stitched to the top of the hat. The brim is turned up and buttons are sewn in place to ﬁnish the eyes and nostrils. Starting at the side of the rib, with 5.5mm hook and A, make 16 ch. Row 1: Work 1 dc in second ch from hook, 1 dc into the next 14 ch, turn (15 sts). Row 2: 1 ch (does not count as a st), work 1 dc into the back loop only of each dc, turn. The last row forms the rib pattern. Rep row 2 until work measures 18in (46cm), turn. Next: With the short edges together, make 1 ch, sl st into the back loop of the ﬁrst dc and the reverse side of the ﬁrst chain stitch at the same time to join. Continue working a sl st into both stitches at the same time to the end of the row to join the seam. This will create a ridge at the centre back of the hat, which will form part of the rib when the brim is turned up. Turn the work to continue. Crown Round 1 (RS): 1 ch (does not count as a st), work 60 dc evenly around the edge of the ribbed brim, sl st to the ďŹ rst dc (60 sts). Round 2: 1 ch (does not count as a st), work 1 dc in each dc, sl st to ďŹ rst dc. Next: Rep the last round 9 more times. Shape crown Adult size only Next (dec): 1 ch (does not count as a st), (dc2dec, 9 dc) 6 times, sl st into ﬁrst dc (60 sts). Both sizes Next (dec): 1 ch (does not count as a st), (dc2dec, 8 dc) 6 times, sl st into ﬁrst dc (54 sts). Next (dec): 1 ch (does not count as a st), (dc2dec, 7 dc) 6 times, sl st into ﬁrst dc (48 sts). Next (dec): 1 ch (does not count as a st), (dc2dec, 6 dc) 6 times, sl st into ﬁrst dc (42 sts). Next (dec): 1 ch (does not count as a st), (dc2dec, 5 dc) 6 times, sl st into ﬁrst dc (36 sts). Next (dec): 1 ch (does not count as a st), (dc2dec, 4 dc) 6 times, sl st into ﬁrst dc (30 sts). Next (dec): 1 ch (does not count as a st), (dc2dec, 3 dc) 6 times, sl st into ﬁrst dc (24 sts). Next (dec): 1 ch (does not count as a st), (dc2dec, 2 dc) 6 times, sl st into ﬁrst dc (18 sts). Next (dec): 1 ch (does not count as a st), (dc2dec, 1 dc) 6 times, sl st into ﬁrst dc (12 sts). Next (dec): 1 ch (does not count as a st), (dc2dec) 6 times, sl st into ﬁrst dc (6 sts). Fasten off and weave in the end. EYEBALLS (MAKE 2) Both sizes Starting at the centre of the front of the eyeball, with 5.5mm hook and B, make 4 ch and sl st to ﬁrst ch to form a ring. *Round 1: 1 ch (does not count as a st), work 5 dc into ring, sl st into ﬁrst dc (5 sts). Round 2 (inc): 1 ch (does not count as a st), (dc2inc) 5 times, sl st into ﬁrst dc (10 sts). Round 3 (inc): 1 ch (does not count as a st), (dc2inc, 1 dc) 5 times, sl st into ﬁrst dc (15 sts). Round 4 (inc): 1 ch (does not count as a st), (dc2inc, 2 dc) 5 times, sl st into ﬁrst dc (20 sts). Next (dec): 1 ch (does not count as a st), (dc2dec, 2 dc) 5 times, sl st into ﬁrst dc (15 sts). Next (dec): 1 ch (does not count as a st), (dc2dec, 1 dc) 5 times, sl st into ﬁrst dc (10 sts). Fasten off, leaving a long length of yarn at the end. Adult size only Next (dec): 1 ch (does not count as a st), (dc2dec, 3 dc) 5 times, sl st into ﬁrst dc (20 sts). Adult size only Next (inc): 1 ch (does not count as a st), (dc2inc, 3 dc) 5 times, sl st into ﬁrst dc (25 sts). EYE SOCKETS (MAKE 2) Both sizes Starting at the centre of the back of the eye socket, with 5.5mm hook and A, make 4 ch and sl st to ﬁrst ch to form a ring. Work from * to * of the eyeball. Next: 1 ch (does not count as a st), work 1 dc into the back loop only of each dc, sl st to ﬁrst dc. Fasten off, leaving a long length of yarn at the end. MAKING UP Eyes Stuff the eyeballs, weave the remaining length of yarn through the last round of stitches and draw up tight before fastening off. Slip the eyeball inside the eye socket and use the long length of yarn left at the end of the socket to sew it in place. Attach the eyes to the top of the hat. Sew the large black buttons to the centre of the eyeballs. Finishing touches Weave in all the ends. Sew the small buttons in place on the front of the hat for the nostrils. raccoon Crocheted in dark grey yarn, the face and mask-like features of the raccoon are worked in cream and black. The striped cords have the characteristics of the raccoonâ&#x20AC;&#x2122;s ringed tail. METHOD OD D The main p part art of the h hat at iss ccrocheted roche eted in one colour.. The facial featu tures ar tu aare e made features in two curve ed sections work ked iin n rows curved worked of double croc o het that are oc e sh hap d by hape ha crochet shaped increasing the sstitches. titches. s. T he e ttwo w pieces wo The are joined using g tthe he main co ccolour lo our u yarn and attached to th he fr ront of the h at. The ears the front hat. are also m a e in two pieces an ad aand d joined made with a ccrocheted r cheted edging in a contrast ro colour he button-shape ed n ose is worked colour.r. T The button-shaped nose in round ds. sT h ttwisted he w sted ccords wi ords are made in or rounds. The two colour u s to prod ur duce tthe he stripes, and colours produce the hat iss ﬁnished d with wiith buttons for eyes and big pomp mpo mp oms. pompoms. FACE Both sizes With 5.5mm hook and B, make 2 ch. Row 1: Work 2 dc into second ch from hook, turn (2 sts). Child size only Row 2 (inc): 1 ch (does not count as a st), (dc2inc) twice, turn (4 sts). Row 3 (inc): 1 ch (does not count as a st), (dc2inc, 1 dc) twice, turn (6 sts). Row 4 (inc): 1 ch (does not count as a st), (dc2inc, 2 dc) twice, turn (8 sts). JJoin in C. Row 5: With C, make 1 ch (does not count as a st), work 1 dc into each dc, turn. Row 6 (inc): With C, make 1 ch (does not count as a st), (dc2inc, 3 dc) twice, turn (10 sts). Row 7 (inc): With C, make 1 ch (does not count as a st), (dc2inc, 4 dc) twice, turn (12 sts). Row 8 (inc): With C, make 1 ch (does not count as a st), (dc2inc, 5 dc) twice, turn (14 sts). Change to B. Row 9 (inc): With B, make 1 ch (does not count as a st), (dc2inc, 6 dc) twice, turn (16 sts). Row 10: With B, make 1 ch (does not count as a st), work 1 dc into each dc, turn. MAIN PIECE E Both sizes Starting at the top of the hat, with 5.5mm hook and A, follow the pattern for the leopard hat main piece on page 14. EARFLAP FACINGS (MAKE 2) Omit if you plan to add a crocheted lining. With 5.5mm hook and A, follow the earﬂap facing pattern as for the leopard hat on page 18. With 4.5mm hook and A, follow edging pattern for the earﬂap facing on page 18.
corner of the curve, work 1 dc into each of the 12 dc down the straight edges of both pieces at the same time to join. Fasten off. Adult size only Row 2: 1 ch (does not count as a st), work 1 dc into each dc, turn. Row 3 (inc): 1 ch (does not count as a st), (dc2inc) 3 times, turn (6 sts). Row 4 (inc): 1 ch (does not count as a st), (dc2inc, 1 dc) 3 times, turn (9 sts). Join in C. Row 5 (inc): With C, make 1 ch (does not count as a st), (dc2inc, 2 dc) 3 times, turn (12 sts). Rows 6–7: With C, make 1 ch (does not count as a st), work 1 dc into each dc, turn. Row 8 (inc): With C, make 1 ch (does not count as a st), (dc2inc, 3 dc) 3 times, turn (15 sts). Row 9: With C, make 1 ch (does not count as a st), work 1 dc into each dc, turn. Change to B. Row 10 (inc): With B, make 1 ch (does not count as a st), (dc2inc, 4 dc) 3 times, turn (18 sts). Next (RS): Make 1 ch, work 1 dc into each stitch up the edge of the next 8 rows, work 3 dc into the ch at the tip of the ear, 1 dc into each stitch down the edge of the next 8 rows. Fasten off, leaving a long length of yarn at the end. Make one more ear piece to match the ﬁrst. Place the two ear pieces together with the wrong sides together. With 5.5mm hook and B, working into the stitches of the inner and outer ear pieces at the same time to join, make 1 ch, work 1 dc into each of the next 9 dc, dc2inc, 1 dc into each of the next 9 dc. Fasten off, leaving a length of yarn at the end. NOSE Both sizes With 4.5mm hook and C, make 4 ch and sl st to ﬁrst ch to form a ring. Round 1: 1 ch (does not count as a st), work 5 dc into ring, sl st into ﬁrst dc (5 sts). Round 2 (inc): 1 ch (does not count as a st), (dc2inc) 5 times, sl st into ﬁrst dc (10 sts). Rounds 3–4: 1 ch (does not count as a st), work 1 dc into each dc, sl st to ﬁrst dc. Fasten off, leaving a long length of yarn at the end. MAKING UP Edging With right side of work facing, using 4.5mm hook and A, rejoin yarn to the back of the hat by the second earﬂap. Next: Work 1 dc in each of the 10 dc across the back of the hat, work 1 dc into each stitch down the edge of the next 9 rows of the ﬁrst earﬂap, ** in the next 3 dc along the lower edge of the earﬂap work dc2inc, 1 dc, dc2inc; work 1 dc into each stitch at the edge of the next 9 rows up the other side of the earﬂap**. Do not fasten off. Join face Child size only Work 1 dc in next dc. Both sizes With the wrong side of the face to the right side of the front of the hat and the lower edges aligned, work 1 dc in each of the next 22 dc of both the face edging and the front of the hat at the same time to join. Child size only Work 1 dc in next dc. Both sizes Work 1 dc into each stitch down the edge of the next 9 rows of the second earﬂap, rep from ** to ** to ﬁnish the edging on the second earﬂap, sl st to ﬁrst dc (80 sts). If making a crocheted lining, fasten off and miss out the next round of edging. Next: 1 ch (does not count as a st), work 1 dc in each of the 10 dc across the back of the hat, ***with wrong sides together, working into the stitches of the earﬂap and earﬂap facing at the same time to join, miss the ﬁrst dc of the earﬂap facing and work 1 dc into each of the next 10 dc, dc2inc, 1 dc into next dc, dc2inc, 1 dc into each of the next 10 dc, miss the last dc of the earﬂap facing***, work 1 dc into each of the next 24 dc across the front of the hat, rep from *** to *** to ﬁnish the edging to join the second earﬂap and earﬂap facing (84 sts). Sl st to next st and fasten off. Using a darning or tapestry needle and the long length of yarn left after fastening off, slip stitch the top edge of the earﬂap facings to the inside of the main piece. Nose Weave the length of yarn left after fastening off the nose through the last round of stitches. Pull the yarn to gather the opening and stitch securely. This will produce a ﬂattened, round button-shaped nose. Sew the nose in place, just above the edging. Ears Push a thin layer of stuffing into the ears. With the length of yarn left after fastening off the edging, sew the lower edges of the inner and outer pieces together. Bring the two corners of each side from the lower edge of the ear to the middle to shape and stitch to hold in place, using the length of yarn B that was left after fastening off. Sew the ears to the main section of the hat, stitching all around the lower edges to keep them securely in place. Finishing touches If making a crocheted lining, attach the twisted cords to the hat after inserting the lining. Weave in all the yarn ends. Place the small black buttons over the larger brown buttons and sew in place for the eyes. Make two 8in (20cm)long striped twisted cords (see page 154) using 3 strands each of yarn B and C. Make two 2[2⅜]in (5cm) pompoms (see page 155) in A and attach each to one end of the twisted cord, then stitch the other end of the cord to the tip of the earﬂap. deer Here is the perfect accessory to keep you warm on a breezy walk in the forest. Topped with a pair of antlers, this doe-eyed woodland creature is crocheted in a lightweight yarn. METHOD ME E TH OD D The e ma main piece ce is croche crocheted hete ted d in n rrounds ound ou ndss of double croc ochet with h tthe he e arrﬂaps aps crochet earﬂ worked in rows w . The ears are em ade in ad rows. made two pieces eac a h, crocheted ed in rows and d each, stitched toget the h r before attaching to tthe he together hat. Unlike the ea ears in mo ost of the othe h r most other projects, they are e not stu uffed at all. T he stuff The antlers, muzzle and d nose e are re ccrocheted roch het e ed on a smaller hook to prod o uc u e a tigh hte er st sstitch itch produce tighter and denser fabric. T he antlers aand n m nd u zle uz The muzzle are stuffed, and the eh at is ﬁnished off ff hat sti t tched over crocheted ed with button eyes stitched ge tassels hanging from patches, and large twisted cords. Starting at the top of the hat, with 5.5mm hook and A, follow the pattern for the leopard hat main piece on page 14. With 5.5mm hook and A, make 2 ch. Work rows 1–10 of the rabbit ears pattern on page 134. Adult size only Earflap facings (make 2) Omit if you plan to add a crocheted lining. Both sizes With 5.5mm hook and B, follow the earﬂap facing pattern as for the leopard hat on page 18. Edging With 4.5mm hook and B, follow edging pattern for the earﬂap facing on page 18. Next: 1 ch (does not count as a st), work 1 dc in each dc, turn. Next (inc): 1 ch (does not count as a st), dc2inc, 1 dc in next 11 dc, dc2inc, turn (15 sts). Next: 1 ch (does not count as a st), work 1 dc in each dc, turn. Next (inc): 1 ch (does not count as a st), dc2inc, 1 dc in next 13 dc, dc2inc, turn (17 sts). Both sizes Next: 1 ch (does not count as a st), work 1 dc in each dc, turn. Rep last row 3 more times. Fasten off, leaving a long length of yarn at the end. With 5.5mm hook and B, make 2 ch. Work rows 1–10 of the rabbit inner ears pattern on page 136. With 4.5mm hook and B, make 15 ch and sl st to ﬁrst ch to form a ring. Round 1: 1 ch (does not count as a st), work 18 dc into ring, sl st into ﬁrst dc (18 sts). Round 2 (dec): 1 ch (does not count as a st), (dc2dec, 4 dc) 3 times, sl st into ﬁrst dc (15 sts). Round 3 (dec): 1 ch (does not count as a st), (dc2dec, 3 dc) 3 times, sl st into ﬁrst dc (12 sts). Round 4: 1 ch (does not count as a st), work 1 dc in each dc, sl st into ﬁrst dc. Next: Rep last round 2 more times. Adult size only Next (inc): 1 ch (does not count as a st), dc2inc, 1 dc in next 7 dc, dc2inc, turn (11 sts). Next: 1 ch (does not count as a st), work 1 dc in each dc, turn. Rep last row once. Next: 1 ch (does not count as a st), dc2inc, 1 dc in next 9 dc, dc2inc, turn (13 sts). Divide for first point Next: 1 ch (does not count as a st), (dc2inc) 3 times, miss 6 dc, (dc2inc) 3 times, sl st into ﬁrst dc. Continue on these 12 sts. Next: 1 ch (does not count as a st), work 1 dc in each dc, sl st into ﬁrst dc. Next: Rep last round 1 more times. Shape top of antler Next: 1 ch (does not count as a st), dc2dec, work 1 dc in next dc, (dc2inc) twice, work 1 dc in next dc, dc2dec, sl st into ﬁrst dc. Next: Rep last round 2 more times. Next (dec): 1 ch (does not count as a st), dc2dec, work 1 dc in next 4 dc, dc2dec, sl st into ﬁrst dc (6 sts). Break yarn and weave through the last round of stitches, draw up to gather and fasten off. Finish first and second points Rejoin yarn to remaining round of 6 sts after dividing for the second point. *Next: 1 ch (does not count as a st), work 1 dc in each dc, sl st into ﬁrst dc. Rep last round 3 more times. Break yarn and weave through the last round of stitches, draw up to gather and fasten off. * Rejoin yarn to the 6 sts remaining for the ﬁrst point. Rep from * to *. Divide for second point Next: 1 ch (does not count as a st), dc2inc, work 1 dc in next 2 dc, miss next 6 dc, dc2inc, work 1 dc in next 2 dc, sl st into ﬁrst dc. Continue on these 8 sts. Next: 1 ch (does not count as a st), work 1 dc in each dc, sl st into ﬁrst dc. Next: Rep last round 3 more times. Starting at the centre of the patch, with 4.5mm hook and B, make 4 ch and sl st to ﬁrst ch to form a ring. Round 1: 1 ch (does not count as a st), work 8 dc into ring, sl st into ﬁrst dc (8 sts). Round 2 (inc): 1 ch (does not count as a st), (dc2inc) 8 times, sl st into ﬁrst dc (16 sts). Fasten off, leaving a long length of yarn. With 4.5mm hook and B, make 4 ch and sl st to ﬁrst ch to form a ring. Round 1: 1 ch (does not count as a st), work 6 dc into ring, sl st into ﬁrst dc (6 sts). Round 2 (inc): 1 ch (does not count as a st), (dc2inc) 6 times, sl st into ﬁrst dc (12 sts). Round 3 (inc): 1 ch (does not count as a st), (dc2inc, 1 dc) 6 times, sl st into ﬁrst dc (18 sts). Next: 1 ch (does not count as a st), work 1 dc in each dc, sl st into ﬁrst dc. Both sizes Next (inc): 1 ch (does not count as a st), (dc2inc, 2 dc) 6 times, sl st into ﬁrst dc (24 sts). Next: 1 ch (does not count as a st), work 1 dc in each dc, sl st into ﬁrst dc. Adult size only Next (inc): 1 ch (does not count as a st), (dc2inc, 3 dc) 6 times, sl st into ﬁrst dc (30 sts). Next: 1 ch (does not count as a st), work 1 dc in each dc, sl st into ﬁrst dc. Fasten off, leaving a long length of yarn at the end. With 4.5mm hook and C, make 5 ch. Round 1: 1 dc into second ch from hook, 1 dc in next 2 ch, 2 dc in end ch, 1 dc down reverse side of ch, sl st into ﬁrst dc (8 sts). Round 2 (inc): 1 ch (does not count as a st), (dc2inc, 2 dc, dc2inc) twice, sl st into ﬁrst dc (12 sts). With right side of work facing, using 4.5mm hook and B, rejoin yarn to the back of the hat by the second earﬂap and follow the edging pattern as for the leopard hat on page 23. Adult size only Round 3 (inc): 1 ch (does not count as a st), (dc2inc, 4 dc, dc2inc) twice, sl st into ﬁrst dc (16 sts). Fasten off, leaving a long length of yarn at the end. Muzzle and nose Use the long length of yarn left after fastening off to stitch the muzzle to the front of the hat, positioning it just above the edging, leaving a small opening. Push some stuffing into the opening to shape the muzzle before stitching it down. Sew the nose in place, horizontally, just above the centre of the muzzle. With RS together sew the inner to the outer ear, leaving lower edge open. Turn RS out, positioning the inner ear so it sits centrally with a slight overlap each side of the larger outer piece. Join the lower edges. Bring the two corners of each side from the lower edge of the ear to the middle to shape. Stitch to hold in place. Attach to the main section of the hat, sewing all around the lower edge to keep them securely in place. Stuff the antlers ﬁrmly, using a pencil or knitting needle to push the stuffing right into the ends. Sew to the top of the hat, in between the ears, stitching all around the lower edges. If making a crocheted lining, attach the twisted cords to the hat after inserting the lining. Sew the patches to the hat, just above the muzzle with the wrong sides facing up. Place the small black buttons over the larger brown buttons and sew in place over the patches for the eyes. Weave in all the yarn ends. Make two twisted cords (see page 154) using A, each measuring 8in (20cm) long, using 6 strands of yarn. Make two tassels (see page 155) measuring 4[5⅛]in (10 cm) long in C, and attach each to one end of the twisted cord. Stitch the other end of the cord to the tip of the earﬂap. sheep A bobble pattern forms the coat of this woolly chap. Make a whole flock for all the family or swap the black yarn for more of the cream to create a different breed of sheep. TENSION 13 sts and 14 rows to 4in (10cm) over double crochet on 6mm hook. 13 sts and 11 rows to 4 in (10cm) over pattern on 6mm hook. Use larger or smaller hook if necessary to obtain correct tension. SPECIAL ABBREVIATION Make bobble (mb) The bobble pattern appears on the reverse side of the hat as you crochet. Yarn round hook, insert hook into next st, catch yarn and draw back through stitch (3 loops on hook), catch yarn again and draw through 2 loops (2 loops on hook), *yrh, insert hook into same st, catch yarn and draw back through stitch (4 loops on hook), catch yarn and draw through 2 loops* (3 loops on hook), repeat from * to * 2 more times (5 loops on hook), yrh, draw through all 5 loops. METHOD METH T OD Th The he ha hat at is sstarted taart r ed ffrom rom th the he to top op off the cr row o n an nd wo orked in roun unds un ds.. Th ds he pattern crown and worked rounds. The is forme is med on th me he rreverse evverse side off tthe he formed the ha at, so the wron on ng side of the wo work will hat, wrong be ffacing a ing you wh ac w en the bobbles es are when croche he eted. The sshaping haping of the e face crocheted. is crochet e ed in ro ows w with indi d vidual balls di crocheted rows individual of yarn join ned e in n to wor orrk ea eac ch section of joined work each colour separat tel e y. The ear ars ar ar are e worked separately. ears in rounds of d o ble croche ou et and d aare re double crochet not stuffed, b u are stitched into ut o sshape hape but before attac acchi h ng to the hat. Butto ton eyes to attaching Button and an emb mb mbroidered b nose ﬁnish the the look embroidered along with h ttwisted wisted cords and d pompo oms. pompoms. MAIN PIECE Both sizes Starting at the top of the hat, with 6mm hook and A, make 4 ch and sl st to ﬁrst ch to form a ring. Round 1: 1 ch (does not count as a st), work 6 dc into ring, sl st into ﬁrst dc (6 sts). Round 2 (inc): 1 ch (does not count as a st), 1 dc in ﬁrst dc, mb in the same dc, (1 dc in next dc, mb in the same dc) 5 times, sl st into ﬁrst dc (12 sts/6 dc and 6 bobbles). Round 3 (inc): 1 ch (does not count as a st), (dc2inc) 12 times, sl st into ﬁrst dc (24 sts). Round 4: 1 ch (does not count as a st), 1 dc in ﬁrst dc, mb in next dc, (1 dc, mb) 11 times, sl st into ﬁrst dc (12 dc and 12 bobbles). Round 5 (inc): 1 ch (does not count as a st), (dc2inc, 1 dc) 12 times, sl st into ﬁrst dc (36 sts). Round 6: 1 ch (does not count as a st), 1 dc in ﬁrst dc, mb in next dc, (1 dc, mb) 17 times, sl st into ﬁrst dc (18 dc and 18 bobbles). Round 7 (inc): 1 ch (does not count as a st), (dc2inc, 2 dc) 12 times, sl st into ﬁrst dc (48 sts). Round 8: 1 ch (does not count as a st), 1 dc in ﬁrst dc, mb in next dc, (1 dc, mb) 23 times, sl st into ﬁrst dc (24 dc and 24 bobbles). Round 9 (inc): 1 ch (does not count as a st), (dc2inc, 3 dc) 12 times, sl st into ﬁrst dc (60 sts). Round 10: 1 ch (does not count as a st), 1 dc in ﬁrst dc, mb in next dc, (1 dc, mb) 29 times, sl st into ﬁrst dc (30 dc and 30 bobbles). Adult size only Next (inc): 1 ch (does not count as a st), (dc2inc, 9 dc) 6 times, sl st into ﬁrst dc (66 sts). Next: 1 ch (does not count as a st), 1 dc in ﬁrst dc, mb in next dc, (1 dc, mb) 32 times, sl st into ﬁrst dc (33 dc and 33 bobbles). Shape face Both sizes Next: 1 ch (does not count as a st), work 1 dc in each dc, sl st into ﬁrst dc. The following is worked in rows: Row 1: 1 ch (does not count as a st), 1 dc in ﬁrst dc, mb in next dc, (1 dc, mb) 11 times, join in yarn B and work 1 dc in next 12 dc, join in a new ball of A here and work (mb, 1dc) 12 times, turn. Row 2: With A, make 1 ch (does not count as a st), work 1 dc in next 23 dc, with B, work 1 dc in next 14 dc, with A, work 1 dc in next 23 dc, turn. Row 3: With A, make 1 ch (does not count as a st), (1 dc, mb) 11 times, with B, work 1 dc in next 16 dc, with A, work (mb, 1dc) 11 times, turn. Row 4: With A, make 1 ch (does not count as a st), work 1 dc in next 21 dc, with B, work 1 dc in next 18 dc, with A, work 1 dc in next 21 dc, turn. Row 5: With A, make 1 ch (does not count as a st), (1 dc, mb) 10 times, with B, work 1 dc in next 20 dc, with A, work (mb, 1dc) 10 times, turn. Row 6: With A, make 1 ch (does not count as a st), work 1 dc in next 19 dc, with B, work 1 dc in next 22 dc, with A, work 1 dc in next 19 dc, turn. Row 7: With A, make 1 ch (does not count as a st), (1 dc, mb) 9 times, with B, work 1 dc in next 24 dc, with A, work (mb, 1dc) 9 times, turn. Row 8: With A, make 1 ch (does not count as a st), work 1 dc in next 18 dc, with B, work 1 dc in next 24 dc, with A, work 1 dc in next 18 dc, turn. Row 9: As row 7. Row 10: As row 8. Continue in yarn A. Next: 1 ch (does not count as a st), 1 dc in ﬁrst 6 dc, (mb in next dc, 1 dc) 6 times, turn. *Next (RS) (dec): 1 ch (does not count as a st), (dc2dec) twice, 1 dc in next 5 dc, (dc2dec) twice, turn (9 sts). Next: 1 ch (does not count as a st), 1 dc in ﬁrst dc, (mb in next dc, 1 dc) 4 times, turn. Next (dec): 1 ch (does not count as a st), dc2dec, 1 dc in next 5 dc, dc2dec, turn (7 sts). Next: 1 ch (does not count as a st), 1 dc in ﬁrst dc, (mb in next dc, 1 dc) 3 times, turn. Next (dec): 1 ch (does not count as a st), dc2dec, 1 dc in next 3 dc, dc2dec, turn (5 sts). Adult size only Next: 1 ch (does not count as a st), 1 dc in ﬁrst dc, (mb in next dc, 1 dc) 5 times, turn. Next (dec): 1 ch (does not count as a st), dc2dec, 1 dc in next 7 dc, dc2dec, turn (9 sts). Next (dec): 1 ch (does not count as a st), dc2dec, mb in next dc, dc2dec, turn (3 sts). Next: 1 ch (does not count as a st), work 1 dc in each dc. * Fasten off. Second earflap Next: With wrong side of hat facing and B, work 1 dc in each of the next 24 dc across the front of the hat, with A, work 1 dc in next dc, (mb in next dc, 1 dc) 6 times, turn. Next: Work from * to * of ﬁrst earﬂap. Fasten off. Both sizes With 6mm hook and A, follow the earﬂap facing pattern as for the leopard hat on page 18. Edging With 5mm hook and A, follow edging pattern for the earﬂap facing on page 18. EARS (MAKE 2) Both sizes Starting at the top of the ear, with 6mm hook and B, make 4 ch and sl st to ﬁrst ch to form a ring. Follow the instructions and the chart as for the giraffe ears on page 116. Fasten off, leaving a long length of yarn. other side of the earﬂap**, work 1 dc into each of the next 24 dc across the front of the hat, work 9 dc evenly down the side of the ﬁrst earﬂap, rep from ** to ** to ﬁnish the edging on the ﬁrst earﬂap, sl st to ﬁrst dc (80 sts). If making a crocheted lining, fasten off and miss out the next round of edging. Next: 1 ch (does not count as a st), work 1 dc in each of the 10 dc across the back of the hat, ***with wrong sides together, working into the stitches of the earﬂap and earﬂap facing at the same time to join, miss the ﬁrst dc of the earﬂap facing and work 1 dc into each of the next 10 dc, dc2inc, 1 dc into next dc, dc2inc, 1 dc into each of the next 10 dc, miss the last dc of the earﬂap facing***, work 1 dc into each of the next 24 dc across the front of the hat, rep from *** to *** to ﬁnish the edging to join the remaining earﬂap and earﬂap facing (84 sts). Sl st to next st and fasten off. Using a darning or tapestry needle and the long length of yarn left after fastening off, slip stitch the top edge of the earﬂap facings to the inside of the main piece. Ears With the long length of yarn left, sew the stitches from each side of the last round of the ear together to join. Bring each corner of the ear to the middle to shape and stitch together. Work a running stitch around the lower edge and draw up the yarn to gather the stitches. Sew the ears in place to each side of the head, stitching all around the lower edges to attach them securely to the hat. Finishing touches If making a crocheted lining, attach the twisted cords to the hat after inserting the lining. Weave in all the yarn ends. Place the small black buttons over the larger white buttons and sew in place on the face for the eyes. Embroider the nose with a single ﬂy stitch (see page 155) using yarn A. Make two twisted cords (see page 154) using B, each measuring 8 in (20cm) long, using 6 strands of yarn. Make two 2[2⅜]in (5cm) pompoms (see page 155) in A and attach each to one end of the twisted cord, then stitch the other end of the cord to the tip of the earﬂap. Weave the ends of yarn from the cords through the stitches of the earﬂap facings to prevent the black showing through the front of the earﬂaps. parrot Brighten up a dull day with a vibrant-coloured parrot hat and add some tropical fun to your winter wardrobe. This parrot even has feathery wings made with a special crochet stitch. METHOD The main piece iiss wo work worked rkked e in ro roun rounds u ds with the earﬂaps and facingss in rows row o s of double crochet. Th he spirals on n tthe h ttop he o op The of the hat, wings, e yes and be eak a u se a eyes beak use smaller hook to prod o uce a tigh hter st stit itch it ch. ch produce tighter stitch. The pattern that ccreates reat re a es the e ffeathery eaatheryy wings is crocodi dile di le stitc ch, w h ch iss fo hi formed crocodile stitch, which by crochet etin et ing in g around the h posts o crocheting off the stitch ch hes e on the previo ous row. Th The eyes stitches previous aare ar e sh shaped by working in n rrounds o nds of ou dou do uble crochet, ha alff ttreble reble and treble double half st titches. The be beak a is a crocheted circle ak stitches. that is fo old ded ed,, st stuffed and stitched to folded, make e a ssimple im mpl p e cu ccurved rved shape. The hat is ﬁnished d off off with with small buttons, twisted cords and tassels. Starting at the top of the hat, with 6mm hook and A, follow the pattern for the leopard hat main piece on page 14. Both sizes With 6mm hook and B, follow the earﬂap facing pattern as for the leopard hat on page 18. With 5mm hook and B, join the yarn to a dc in the ﬁrst round at the top of the hat. Next: *Make 11 ch, 2 dc into second ch from hook, 2 dc into each of the next 9 ch, sl st into the same dc at the top of the hat; rep from * once more, sl st into next dc. Next: Rep from * to make 2 spirals in each of the remaining 5 dc at the top of the hat (12 spirals). Fasten off and weave in the ends. Follow the chart for the spirals on the duck hat, page 79. Wings (make 2) Starting at the tip of the wing, with 5mm hook and B, make 9 ch. Following the pattern for the owl wings on page 124, work rows 1–6 in B. Work rows 7–12 in C. Work rows 13 to end in A. Fasten off, leaving a long length of yarn at the end. EYES (MAKE 2) With 5mm hook and D, make 4 ch and sl st to ﬁrst ch to form a ring. Round 1: 1 ch (does not count as a st), work 6 dc into ring, sl st to ﬁrst dc (6 sts). Round 2 (inc): 1 ch (does not count as a st), dc2inc into the ﬁrst dc, htr2inc into the next dc, (tr2inc) 2 times, htr2inc, dc2inc, sl st to ﬁrst dc (12 sts). Round 3 (inc): 1 ch (does not count as a st), (dc2inc) 3 times, htr2inc into the next dc, (tr2inc) 4 times, htr2inc, (dc2inc) 3 times, sl st to ﬁrst dc (24 sts). Round 4 (inc): 1 ch (does not count as a st), 1 dc in next 8 sts, htr2inc, 1 tr into the next 2 sts, (tr2inc) 2 times, 1 tr in next 2 sts, htr2inc, 1 dc into the next 8 sts, sl st to ﬁrst dc (28 sts). Join in yarn A. Round 5 (inc): 1 ch (does not count as a st), work 1 dc in next 6 sts, (dc2inc, 2dc) 6 times, 1 dc in next 4 sts, sl st to ﬁrst dc, turn (34 sts). Fasten off, leaving a long length of yarn A at the end. BEAK With 5mm hook and E, make 4 ch and join with a sl st to ﬁrst ch to form a ring. Round 1: 1 ch (does not count as a st), work 6 dc into the ring (6 sts). Round 2 (inc): 1 ch (does not count as a st), (dc2inc) 6 times, sl st to the ﬁrst dc (12 sts). Round 3 (inc): 1 ch (does not count as a st), (dc2inc, 1 dc) 6 times, sl st to the ﬁrst dc (18 sts). Round 4 (inc): 1 ch (does not count as a st), (dc2inc, 2 dc) 6 times, sl st to the ﬁrst dc (24 sts). Round 5 (inc): 1 ch (does not count as a st), (dc2inc, 3 dc) 6 times, sl st to the ﬁrst dc (30 sts). Round 6 (inc): 1 ch (does not count as a st), (dc2inc, 4 dc) 6 times, sl st to the ﬁrst dc (36 sts). Sl st to next st and fasten off leaving a long length of yarn. MAKING UP Edging With right side of work facing, using 5mm hook and A, rejoin yarn to the back of the hat by the second earﬂap and follow the edging pattern as for the leopard hat on page 23. Eyes Position the eyes on the front of the hat with the wider part just above the edging and sew all around the edges using the length of yarn left after fastening off. Work a few stitches into the centre to hold them in place with matching yarn. Sew a button to each, inside the ﬁrst round of crochet, to ﬁnish the eyes. Fold the crocheted circle in half. With the length of yarn left after fastening off, stitch the curved edges together, leaving a small opening. Push a little stuffing through the opening to ﬁll the beak before stitching closed. Sew the beak in place in between the eyes with the curved side facing out, stitching all around it to secure it in position. Weave in all the yarn ends. Make two twisted cords (see page 154) using B, each measuring 8in (20cm) long, using 6 strands of yarn. Make two tassels (see page 155) measuring 4[5⅛] in (10cm) long in B, and attach each to one end of the twisted cord, then stitch the other end of the cord to the tip of the earﬂap. If making a crocheted lining, attach the wings and twisted cords to the ear ﬂaps after inserting the lining. Press the wings with a cool iron. Position each wing over an earﬂap and sew in place, matching the colours of the yarn. See pages 142–5 for how to make and attach a cosy ﬂeece or crocheted lining. zebra This smart zebra hat in monochrome stripes with its matching fringed mane and twisted cords is great fun to wear. The detailed ears and nose with its embroidered nostrils make it especially cute. METHOD D The stripess are pr p produced od ducced b byy al alte alternating tern rnat a ing yarns everyy two rows. Th The e bl blac ackk pa part black of the ears is worked in rrounds ound ou nds of d ouble double crochet with th the white inn nne ers wo ork rked inners worked separately in n rows and sti titc tche hed d on on. stitched The nose is cr croc o heted us sin ing g a sm smaller crocheted using hook to create te a ﬁrmer rme merr fabric fabr bric ic and and n then stuffed to giv ve it sshape hape and d ﬁnished give with embroid dered ed nostrils. A sstriped triped band embroidered worked in ro rows of double cro roch c et with a crochet fringe att tac a hed to one long ed edge forms attached the zebr ra’ a’s mane, which is stitc tched to the zebra’s stitched top and d do d wn the back of the h at. down hat. Starting at the top of the hat, with 6mm hook and A, make 4 ch and sl st to ﬁrst ch to form a ring. Round 1: 1 ch (does not count as a st), work 6 dc into ring, sl st into ﬁrst dc (6 sts). Round 2 (inc): 1 ch (does not count as a st), (dc2inc) 6 times, sl st into ﬁrst dc (12 sts). JJoin in yarn B. Round 3 (inc): With B, make 1 ch (does not count as a st), (dc2inc, 1 dc) 6 times, sl st into ﬁrst dc (18 sts). Round 4 (inc): 1 ch (does not count as a st), (dc2inc, 2 dc) 6 times, sl st into ﬁrst dc (24 sts). Round 5 (inc): With A, make 1 ch (does not count as a st), (dc2inc, 3 dc) 6 times, sl st into ﬁrst dc (30 sts). R Round 6 (inc): 1 ch (does not count as a sst), (dc2inc, 4 dc) 6 times, sl st into ﬁrst dc ((36 sts). R Round 7 (inc): With B, make 1 ch (does n not count as a st), (dc2inc, 5 dc) 6 times, ssl st into ﬁrst dc (42 sts). R Round 8 (inc): 1 ch (does not count as a st), (dc2inc, 6 dc) 6 times, sl st into ﬁrst d dc (48 sts). C Continue, following the pattern from rround 9 of the leopard hat on page 14, aalternating yarn A and B as before and ﬁnishing the last round of the child size iin B and the last 2 rounds of the adult ssize in A. Next: With B, starting at the centre back, 1 ch (does not count as a st), work 1 dc in next 5 dc. The following is worked in rows: Row 1 (RS): With B, work 1 dc in next 13 dc, turn. Adult size only Next (WS) (dec): With B, make 1 ch (does not count as a st), dc2dec, 1 dc in next 11 dc, dc2dec, turn, 1 ch (does not count as a st). Join in yarn A. Next: With A, work 1 dc in next 13 dc, turn. Both sizes Next (dec): Continue as before, following the earﬂap pattern from * to * on page 16, and at the same time changing colour every two rows. Work the last row of the earﬂap in child size in B. Fasten off. Second earflap Next: With right side facing, rejoin B to the front of the hat. Work 1 dc in each of the 24 dc across the front of the hat. Complete the second earﬂap, following the pattern as for the leopard on page 16 and alternating the colours so the stripes match the ﬁrst earﬂap. Edging With 5mm hook and B, follow the edging pattern for the earﬂap facing on page 18. INNER EARS (MAKE 2) Both sizes With 6mm hook and A, make 2 ch. Row 1: Work 3 dc into second ch from hook, turn (3 sts). Row 2: 1 ch (does not count as a st), work 1 dc in each dc, turn. Row 3 (inc): 1 ch (does not count as a st), dc2inc, 1 dc, dc2inc, turn (5 sts). Row 4: As row 2. Row 5 (inc): 1 ch (does not count as a st), dc2inc, 1 dc in next 3 dc, dc2inc, turn (7 sts). Row 6: As row 2. Adult size only Next (inc): 1 ch (does not count as a st), dc2inc, 1 dc in next 5 dc, dc2inc, turn (9 sts). Both sizes Next: As row 2. Next: Rep last row 1 more times. Fasten off, leaving a long length of yarn at the end. Adult size only Next (inc): 1 ch (does not count as a st), (dc2inc, 4 dc) 6 times, sl st into ﬁrst dc (36 sts). Both sizes Next round: 1 ch (does not count as a st), work 1 dc in each dc, sl st to ﬁrst dc. Rep last round 4 more times. Fasten off, leaving a long length of yarn at the end. With 4.5mm hook and B, make 4 ch and join with a sl st to the ﬁrst ch to form a ring. Round 1: 1 ch (does not count as a st), work 6 dc into ring, sl st to ﬁrst dc (6 sts). Round 2 (inc): 1 ch (does not count as a st), (dc2inc) 6 times, sl st into ﬁrst dc (12 sts). Round 3 (inc): 1 ch (does not count as a st), (dc2inc, 1 dc) 6 times, sl st into ﬁrst dc (18 sts). Round 4 (inc): 1 ch (does not count as a st), (dc2inc, 2 dc) 6 times, sl st into ﬁrst dc (24 sts). Round 5 (inc): 1 ch (does not count as a st), (dc2inc, 3 dc) 6 times, sl st into ﬁrst dc (30 sts). MANE With 6mm hook and B, make 3 ch. Row 1: Work 1 dc into second ch from hook, 1 dc in next ch, turn (2 sts). Row 2: 1 ch (does not count as a st), work 1 dc in each dc, turn. Join in A and rep row 2 twice. Using yarn B, rep row 2 twice. Continue in this way, working 2 rows of double crochet and at the same time alternating yarn A and B to create the stripes until you have completed 30 rows. Fasten off. With right side of work facing, using 5mm hook and B, rejoin yarn to the back of the hat by the second earﬂap and follow the edging pattern as for the leopard hat on page 23. Fasten off and slip stitch the top edge of the earﬂap facings to the inside of the main piece using yarn A. Stuff the nose lightly to pad it out, keeping a ﬂattened shape. Sew the stitches from each side of the last round together to form a straight edge. Stitch the nose in place on the front of the hat with the straight edge sitting just above the second row of edging stitches. Using yarn A and a blunt-ended darning needle, embroider the nostrils by working 2 straight stitches (see page 155) for each. Push a thin layer of stuffing into the ears, keeping the shape ﬂat. With the long length of yarn left, sew the stitches from each side of the last round together to join, forming a straight edge. Sew the inner ear to the centre of the ear and aligning the lower edges. Bring each corner of the ear to the middle to shape and stitch together. Sew in place to each side of the head, stitching all around the lower edges to prevent them from ﬂopping over. remove the hook and then thread the ends back through the loop, pulling them tight (see 2). Repeat to the end of the mane, attaching one tassel to the edge of each row and matching the colours of the stripes. Trim the ends of the fringe and sew in place, starting at the lower edge of the back, matching the stripes up the centre back of the hat and ending at the second round at the front of the hat. Finishing touches If making a crocheted lining, attach the twisted cords to the hat after inserting the lining. Weave in all the yarn ends. Make two 8in (20cm)-long striped twisted cords (see page 154) using 3 strands each of yarn A and B. Make two tassels (see page 155) measuring 4[5⅛]in (10cm) long in B, and attach each to one end of the twisted cord, then stitch the other end of the cord to the tip of the earﬂap. duck This cheery yellow hat is sure to make you feel spring-like even in the depths of winter. The duckâ&#x20AC;&#x2122;s bill forms a peak at the front of this beanie, while crocheted spirals produce a tuft of plumage to decorate the top. This hat att b begins egins with h the rib rib, ib, wh ib w which ich is worked d in rows of doub ub ble ccrochet roch ro ch het e through double the ba ack loops off th tthe e stitches. 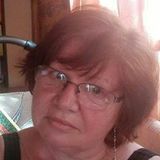 The e short back edges aare re joined ed b hing hi ng tthe he byy slip stitchi stitching stitchess ttogether ogetther to form a ring g, which ring, is turned on iits ts side to produce e the ribbed effect. T he e ﬁrst do The ﬁrst round off stitches of the crown iss work rkked eve venl ve n y around worked evenly the stitches at the edge e of the rib. The crown shaping g is achieve ed by decreasing achieved the stitches, and the main part of the hat is ﬁnished with spirals worked into the last round of stitches. These are made with a length of chain stitches. Two double crochet stitches are worked into each chain to make it twist. The duck’s bill starts off with a foundation of chain stitches and then is crocheted in rounds, increasing the stitches to shape the piece. At the end, a round of decreasing is worked into the back loops of the stitches. The bill is stuffed and the opening stitched together. This forms a ﬂat surface at the back. The bill is stitched to the hat through the front loops of the decrease row, creating a neat ﬁnish. RIB Both sizes Starting at the side of the rib, with 5.5mm hook and A, make 6 ch. Row 1: Work 1 dc in second ch from hook, 1 dc into the next 4 ch, turn (5 sts). Row 2: 1 ch (does not count as a st), work 1 dc into the back loop only of each dc, turn. The last row forms the rib pattern. Rep row 2 until work measures 18in (46cm). Next: With the short edges together, make 1 ch, sl st into the back loop of the ﬁrst dc and the reverse side of the ﬁrst chain stitch at the same time to join. Continue working a sl st into both stitches at the same time to the end of the row to join the seam. This will create a ridge at the centre back of the hat, which will form part of the rib. Do not turn. The following is worked in rounds: Follow the chart for the crown of the frog hat on page 28. Round 1 (RS): 1 ch (does not count as a st), work 60 dc evenly around the edge of the ribbed band, sl st to the ďŹ rst dc (60 sts). Round 2: 1 ch (does not count as a st), work 1 dc in each dc, sl st to ďŹ rst dc. Next: Rep the last round 11 more times. Shape crown Work as for the crown shaping in the frog pattern on page 29. Do not fasten off at the end. *Make 11 ch, 2 dc into second ch from hook, 2 dc into each of the next 9 ch, sl st into the same dc from the last round of crown shaping; rep from * once more, sl st into next dc. Next: Rep from * to make 2 spirals in each of the remaining 5 dc (12 spirals). Fasten off, leaving a long length of yarn. Weave the yarn through the 6 dc of the last round of crown shaping and draw up to gather and close the hole at the top of the hat. BILL Both sizes With 5.5mm hook and B, make 9 ch. Round 1 (RS): Work 1 dc in second ch from hook, 1 dc into the next 6 ch, work 2 dc into the end ch, work 1 dc into the reverse side of the remaining 7 ch, sl st into ﬁrst dc (16 sts). Round 2 (inc): 1 ch (does not count as a st), dc2inc, 1 dc in next 6 dc, (dc2inc) twice, 1 dc in next 6 dc, dc2inc, sl st into ﬁrst dc (20 sts). Round 3 (inc): 1 ch (does not count as a st), dc2inc, 1 dc in next 8 dc, (dc2inc) twice, 1 dc in next 8 dc, dc2inc, sl st into ﬁrst dc (24 sts). Round 4: 1 ch (does not count as a st), work 1 dc into each dc, sl st into ﬁrst dc. Round 5 (inc): 1 ch (does not count as a st), dc2inc, 1 dc in next 10 dc, (dc2inc) twice, 1 dc in next 10 dc, dc2inc, sl st into ﬁrst dc (28 sts). Round 6: As round 4. Round 7 (inc): 1 ch (does not count as a st), dc2inc, 1 dc in next 12 dc, (dc2inc) twice, 1 dc in next 12 dc, dc2inc, sl st into ﬁrst dc (32 sts). Round 8: As round 4. Rep last round 0 more times. Next (dec): 1 ch (does not count as a st), working into the back loop only of each stitch, (dc2dec) twice, 8 dc, (dc2dec) 4 times, 8 dc, (dc2dec) twice (24 sts). This will help to keep the back of the bill ﬂat, making it easier to sew it to the hat. Fasten off, leaving a long length of yarn at the end. MAKING UP Bill Stuff the bill, keeping a ﬂattened shape. Sew together the 12 sts from each side of the opening. Attach the bill, positioning it over the rib and stitching the front loops of the decrease row to the main part. Finishing touches Weave in the ends of the yarn. Place the small black buttons over the larger white buttons and sew in place for the eyes. tiger This project uses intarsia and different crochet stitches to create the tiger stripes. For a less complicated version, follow the instructions for the main piece of the zebra with orange and black yarn. the longer ones. The cheeks, ears and nose are crocheted in rounds; they are shaped by increasing the stitches. The hat is ﬁnished off with button eyes and striped twisted cords with a big tassel attached to each one. Round 9 (inc): With A, make 1 ch (does not count as a st), (dc2inc, 7 dc) 6 times, sl st into ﬁrst dc (54 sts). Round 10 (inc): 1 ch (does not count as a st), (dc2inc, 8 dc) 6 times, sl st into ﬁrst dc (60 sts). Child size only MAIN PIECE Before you begin, wind 2 x 25g balls each of yarns B and C.
Both sizes Starting at the top of the hat, with 5.5mm hook and A, make 4 ch and sl st to ﬁrst ch to form a ring. Rounds 1–8: Follow the pattern as for the zebra hat (see page 70), joining in B on round 3 and alternating the yarns every two rounds to create the stripes. Next: With B, make 1 ch (does not count as a st), work 1 dc in each dc, sl st into ﬁrst dc. Next: 3 ch (counts as ﬁrst tr), (1 htr in next 2 sts, 1 dc in next 4 sts, 1 htr in next 2 sts, 1 tr in next 2 sts) 5 times, 1 htr in next 2 sts, 1 dc in next 4 sts, 1 htr in next 2 sts, 1 tr in next st, sl st into third of 3 ch. Fasten off B. Shape face The following is worked in rows: Row 1: With A, make 1 ch (does not count as a st), 1 dc in same st, 1 dc in next st, (1 htr in next 2 sts, 1 tr in next 2 sts, 1 htr in next 2 sts, 1 dc in next 4 sts) 5 times, 1 htr in next 2 sts, 1 tr in next 2 sts, 1 htr in next 2 sts, 1 dc in next 2 sts, turn. Row 2: As row 1. Fasten off A. Join in C.
Row 3: With C, make 1 ch (does not count as a st), work 1 dc in next 23 sts, rejoin A and work 1 dc in next 14 sts, join in a new ball of C and work 1 dc in next 23 sts, turn. Rejoin yarn B. Row 4: With B, make 3 ch (counts as ﬁrst tr), (1 htr in next 2 sts, 1 dc in next 4 sts, 1 htr in next 2 sts, 1 tr in next 2 sts) twice, 1 htr in next 2 sts, with A, work 1 dc in next 4 sts, 1 htr in next 2 sts, 1 tr in next 2 sts, 1 htr in next 2 sts, 1 dc in next 4 sts, join in a new ball of B and work (1 htr in next 2 sts, 1 tr in next 2 sts, 1 htr in next 2 sts, 1 dc in next 4 sts) twice, 1 htr in next 2 sts, 1 tr in next st, turn. Row 5: With B, make 3 ch (counts as ﬁrst tr), (1 htr in next 2 sts, 1 dc in next 4 sts, 1 htr in next 2 sts, 1 tr in next 2 sts) twice, 1 htr in next st, with A, work 1 htr in next st, 1 dc in next 4 sts, 1 htr in next 2 sts, 1 tr in next 2 sts, 1 htr in next 2 sts, 1 dc in next 4 dc, 1 htr in next st, with B, work 1 htr in next st, (1 tr in next 2 sts, 1 htr in next 2 sts, 1 dc in next 4 sts, 1 htr in next 2 sts) twice, 1 tr in third of 3 ch, turn. Row 6: With C, make 1 ch (does not count as a st), 1 dc in same st, (1 dc in next st, 1 htr in next 2 sts, 1 tr in next 2 sts, 1 htr in next 2 sts, 1 dc in next 3 sts) twice, with A, work 1 dc in next st, 1 htr in next 2 sts, 1 tr in next 2 sts, 1 htr in next 2 sts, 1 dc in next 4 sts, 1 htr in next 2 sts, 1 tr in next 2 sts, 1 htr in next 2 sts, 1 dc in next st, with C, work (1 dc in next 3 sts, 1 htr in next 2 sts, 1 tr in next 2 sts, 1 htr in next 2 sts, 1 dc in next st) twice, 1 dc in third of 3 ch, turn. Row 7: With C, make 1 ch (does not count as a st), 1 dc in same st, 1 dc in next st, 1 htr in next 2 sts, 1 tr in next 2 sts, 1 htr in next 2 sts, 1 dc in next 4 sts, 1 htr in next 2 sts, 1 tr in next 2 sts, 1 htr in next 2 sts, 1 dc in next 2 sts, with A, work (1 dc in next 2 sts, 1 htr in next 2 sts, 1 tr in next 2 sts, 1 htr in next 2 sts, 1 dc in next 2 sts) twice, with C, work (1 dc in next 2 sts, 1 htr in next 2 sts, 1 tr in next 2 sts, 1 htr in next 2 sts, 1 dc in next 2 sts) twice, turn. Row 8: With B, make 3 ch (counts as ﬁrst tr), 1 htr in next 2 sts, 1 dc in next 4 sts, 1 htr in next 2 sts, 1 tr in next 2 sts, 1 htr in next 2 sts, 1 dc in next 4 sts, 1 htr in next 2 sts, with A, work (1 tr in next 2 sts, 1 htr in next 2 sts, 1 dc in next 4 dc, 1 htr in next 2 sts) twice, 1 tr in next 2 sts, with B, work 1 htr in next 2 sts, 1 dc in next 4 sts, 1 htr in next 2 sts, 1 tr in next 2 sts, 1 htr in next 2 sts, 1 dc in next 4 sts, 1 htr in next 2 sts, 1 tr in next st, turn. Row 9: As row 8, ﬁnishing with 1 tr in third of 3 ch, turn. Fasten off B. Row 10: With C, make 1 ch (does not count as a st), 1 dc in same st, 1 dc in next st, 1 htr in next 2 sts, 1 tr in next 2 sts, 1 htr in next 2 sts, 1 dc in next 4 sts, 1 htr in next 2 sts, 1 tr in next 2 sts, 1 htr in next 2 sts, with A, work (1 dc in next 4 sts, 1 htr in next 2 sts, 1 tr in next 2 sts, 1 htr in next 2 sts) twice, 1 dc in next 4 sts, with C, work 1 htr in next 2 sts, 1 tr in next 2 sts, 1 htr in next 2 sts, 1 dc in next 4 sts, 1 htr in next 2 sts, 1 tr in next 2 sts, 1 htr in next 2 sts, 1 dc in next st, 1 dc in third of 3 ch, turn. Adult size only Next (inc): With B, make 1 ch (does not count as a st), (dc2inc, 9 dc) 6 times, sl st into ﬁrst dc (66 sts). Next: 2 ch (counts as ﬁrst htr), 1 htr in next st, (1 tr in next 2 sts, 1 htr in next 2 sts, 1 dc in next 4 sts, 1 htr in next 2 sts) 6 times, 1 tr in next 2 sts, 1 htr in next 2 sts, sl st into second of 2 ch. Fasten off B. Shape face The following is worked in rows: Row 1: With A, make 1 ch (does not count as a st), 1 dc in same st, 1 dc in next 4 sts, (1 htr in next 2 sts, 1 tr in next 2 sts, 1 htr in next 2 sts, 1 dc in next 4 sts) 6 times, 1 dc in next st, turn. Row 2: As row 1. Fasten off A. Join in C. Row 3: With C, make 1 ch (does not count as a st), work 1 dc in next 26 sts, rejoin A and work 1 dc in next 14 sts, join in a new ball of C and work 1 dc in next 26 sts, turn. Rejoin yarn B. Row 4: With B, make 2 ch (counts as ﬁrst htr), 1 htr in next st, (1 tr in next 2 sts, 1 htr in next 2 sts, 1 dc in next 4 sts, 1 htr in next 2 sts) twice, 1 tr in next 2 sts, 1 htr in next st, with A, work 1 htr in next st, 1 dc in next 4 sts, 1 htr in next 2 sts, 1 tr in next 2 sts, 1 htr in next 2 sts, 1 dc in next 4 sts, 1 htr in next st, join in a new ball of B and work 1 htr in next st, (1 tr in next 2 sts, 1 htr in next 2 sts, 1 dc in next 4 sts, 1 htr in next 2 sts) twice, 1 tr in next 2 sts, 1 htr in next 2 sts, turn. Row 5: With B, make 2 ch (counts as ﬁrst htr), 1 htr in next st, (1 tr in next 2 sts, 1 htr in next 2 sts, 1 dc in next 4 sts, 1 htr in next 2 sts) twice, 1 tr in next 2 sts, with A, work 1 htr in next 2 sts, 1 dc in next 4 sts, 1 htr in next 2 sts, 1 tr in next 2 sts, 1 htr in next 2 sts, 1 dc in next 4 sts, 1 htr in next 2 sts, with B, work (1 tr in next 2 sts, 1 htr in next 2 sts, 1 dc in next 4 sts, 1 htr in next 2 sts) twice, 1 tr in next 2 sts, 1 htr in next st, 1 htr in second of 2 ch, turn. Row 6: With C, make 1 ch (does not count as a st), 1 dc in same st, (1 dc in next 4 sts, 1 htr in next 2 sts, 1 tr in next 2 sts, 1 htr in next 2 sts) twice, 1 dc in next 2 sts, with A, work 1 dc in next 2 sts, 1 htr in next 2 sts, 1 tr in next 2 sts, 1 htr in next 2 sts, 1 dc in next 4 sts, 1 htr in next 2 sts, 1 tr in next 2 sts, 1 htr in next 2 sts, 1 dc in next 2 sts, with C, work 1 dc in next 2 sts, (1 htr in next 2 sts, 1 tr in next 2 sts, 1 htr in next 2 sts, 1 dc in next 4 sts) twice, 1 dc in second of 2 ch, turn. Row 7: With C, make 1 ch (does not count as a st), 1 dc in same st, (1 dc in next 4 sts, 1 htr in next 2 sts, 1 tr in next 2 sts, 1 htr in next 2 sts) twice, 1 dc in next st, with A, work 1 dc in next 3 sts, 1 htr in next 2 sts, 1 tr in next 2 sts, 1 htr in next 2 sts, 1 dc in next 4 sts, 1 htr in next 2 sts, 1 tr in next 2 sts, 1 htr in next 2 sts, 1 dc in next 3 sts, with C, work 1 dc in next st, (1 htr in next 2 sts, 1 tr in next 2 sts, 1 htr in next 2 sts, 1 dc in next 4 sts) twice, 1 dc in next dc, turn. Row 8: With B, make 2 ch (counts as ﬁrst htr), (1 htr in next st, 1 tr in next 2 sts, 1 htr in next 2 sts, 1 dc in next 4 sts, 1 htr in next st) twice, with A, work (1 htr in next st, 1 tr in next 2 sts, 1 htr in next 2 sts, 1 dc in next 4 dc, 1 htr in next st) twice, 1 htr in next st, 1 tr in next 2 sts, 1 htr in next st, with B, work (1 htr in next st, 1 dc in next 4 sts, 1 htr in next 2 sts, 1 tr in next 2 sts, 1 htr in next st) twice, 1 htr in next st, turn. Row 9: As row 8, ﬁnishing with 1 htr in second of 2 ch, turn. Row 10: With C, make 1 ch (does not count as a st), 1 dc in same st, (1 dc in next 4 sts, 1 htr in next 2 sts, 1 tr in next 2 sts, 1 htr in next 2 sts) twice, with A, work 1 dc in next 4 sts, (1 htr in next 2 sts, 1 tr in next 2 sts, 1 htr in next 2 sts, 1 dc in next 4 sts,) twice, with C, work (1 htr in next 2 sts, 1 tr in next 2 sts, 1 htr in next 2 sts, 1 dc in next 4 sts) twice, 1 dc in second of 2 ch, turn. Row 11: As Row 10, ﬁnishing with 1 dc in last dc, turn. Fasten off C. Row 12: As Row 8. Row 2 (WS) (dec): Join in C and work 1 ch (does not count as a st), dc2dec, 1 dc in next 11 dc, dc2dec, turn, 1 ch (does not count as a st). Both sizes Next: With C, work 1 dc in next 13 dc, turn. Join in B to child’s size hat. Next (dec): *With B, make 1 ch (does not count as a st), dc2dec, 1 dc in next 9 dc, dc2dec, turn (11 sts). Next: With B, make 1 ch (does not count as a st), work 1 dc in each dc, turn. Next (dec): With C, make 1 ch (does not count as a st), dc2dec, 1 dc in next 7 dc, dc2dec, turn (9 sts). Next: With C, make 1 ch (does not count as a st), work 1 dc in each dc, turn. Next (dec): With B, make 1 ch (does not count as a st), dc2dec, 1 dc in next 5 dc, dc2dec, turn (7 sts). Next: With B, make 1 ch (does not count as a st), work 1 dc in each dc, turn. Next (dec): With C, make 1 ch (does not count as a st), dc2dec, 1 dc in next 3 dc, dc2dec, turn (5 sts). Next: With C, make 1 ch (does not count as a st), work 1 dc in each dc, turn. Next (dec): With C, make 1 ch (does not count as a st), dc2dec, 1 dc in next 1 dc, dc2dec (3 sts). * Fasten off. Adult size only Row 1 (RS): With B, work 1 dc in next 15 sts, turn. Adult size only Row 1 (RS): With B, work 1 dc in next 15 sts, turn. Row 2 (WS) (dec): Join in C and work 1 ch (does not count as a st), dc2dec, 1 dc in next 11 sts, dc2dec, turn, 1 ch (does not count as a st). Both sizes Next: With C, work 1 dc in next 13 dc, turn. Next: Work from * to * of ﬁrst earﬂap. Fasten off. Both sizes With 5.5mm hook and A, follow the earﬂap facing pattern as for the leopard hat on page 18. EARS (MAKE 2) Both sizes With 5.5mm hook and A, follow the ear pattern as for the leopard hat on page 19. Cheeks Sew the cheeks to the face, around 5⁄8in (1.5cm) from the lower edge, setting them close together. With 3mm hook and D, follow the nose pattern as for the leopard hat on page 20. CHEEKS (MAKE 2) Both sizes With 5.5mm hook and C, follow the cheek pattern as for the rabbit hat on page 137. MAKING UP Edging Sew together the back seam of the hat. With right side of work facing, using 4.5mm hook and A, rejoin yarn to the back of the hat by the second earﬂap and follow the edging pattern as for the leopard hat on page 23. Finish the ears as for the leopard hat on page 23. Flatten the nose and sew the 12 stitches from each side of the top edge together. Sew the nose to the centre front of the hat, with the stitched edge in line with the top shaping of the cheeks. Finishing touches If making a crocheted lining, attach the twisted cords to the hat after inserting the lining. Weave in all the yarn ends. Place the small black buttons over the larger brown buttons and sew in place for the eyes. Make two 8in (20cm)-long striped twisted cords (see page 154) using 3 strands each of yarn A and B. Make two tassels (see page 155) measuring 4[5⅛]in (10cm) long in B, and attach each to one end of the twisted cord, then stitch the other end of the cord to the tip of the earﬂap. husky After a snowfall, an exciting day of sledging calls for warm accessories, such as this husky hat in grey and white yarn with cute ears, twisted cords and pompoms. M MAIN PIECE Both sizes B S Starting at the top of the hat, with 6mm hook and A, follow the pattern for the leopard hat main piece on page 14 to the e end of round 10. Both sizes B Next: 1 ch (does not count as a st), work 1 dc in each dc, sl st into ﬁrst dc. Rep last row 2 more times. Shape face When working rows 1 to 6, carry unused yarn across the back of the centre 24 stitches (see Joining in colours, page 153). The following is worked in rows: Row 1: 1 ch (does not count as a st), work 1 dc in next 22 dc, join in B and work 1 dc in next 4 dc, with A, work 1 dc in next 8 dc, with B, work 1 dc in next 4 dc, with A, work 1 dc in next 22 dc, turn. Row 2: With A, make 1 ch (does not count as a st), work 1 dc in next 21 dc, with B, work 1 dc in next 6 dc, with A, work 1 dc in next 6 dc, with B, work 1 dc in next 6 dc, with A, work 1 dc in next 21 dc, turn. Row 3: With A, make 1 ch (does not count as a st), work 1 dc in next 20 dc, with B, work 1 dc in next 8 dc, with A, work 1 dc in next 4 dc, with B, work 1 dc in next 8 dc, with A, work 1 dc in next 20 dc, turn. Row 4: With A, make 1 ch (does not count as a st), work 1 dc in next 19 dc, with B, work 1 dc in next 9 dc, with A, work 1 dc in next 4 dc, with B, work 1 dc in next 9 dc, with A, work 1 dc in next 19 dc, turn. Rows 5–6: With A, make 1 ch (does not count as a st), work 1 dc in next 18 dc, with B, work 1 dc in next 11 dc, with A, work 1 dc in next 2 dc, with B, work 1 dc in next 11 dc, with A, work 1 dc in next 18 dc, turn. Row 7: With A, make 1 ch (does not count as a st), work 1 dc in next 18 dc, with B, work 1 dc in next 24 dc, join in the second ball of yarn A and work 1 dc in next 18 dc in A, turn. Rows 8–14: With A, make 1 ch (does not count as a st), work 1 dc in next 18 dc, with B, work 1 dc in next 24 dc, with A, work 1 dc in next 18 dc, turn. First earflap With 6mm hook and A, follow the pattern for the ﬁrst earﬂap on the leopard hat on page 16. Second earflap Next: With right side facing and yarn B, work 1 dc in each of the 24 dc across the front of the hat. Rejoin and continue in yarn A, following the pattern for the second earﬂap on the leopard hat on page 16. EARS (MAKE 2) Both sizes With 6mm hook and B, make 2 ch. *Row 1: Work 3 dc into second ch from hook, turn (3 sts). Row 2 (inc): 1 ch (does not count as a st), dc2inc, 1 dc, dc2inc, turn (5 sts). Row 3 (inc): 1 ch (does not count as a st), dc2inc, 1 dc in next 3 dc, dc2inc, turn (7 sts). Row 4 (inc): 1 ch (does not count as a st), dc2inc, 1 dc in next 5 dc, dc2inc, turn (9 sts). Row 5 (inc): 1 ch (does not count as a st), dc2inc, 1 dc in next 7 dc, dc2inc, turn (11 sts). Row 6 (inc): 1 ch (does not count as a st), dc2inc, 1 dc in next 9 dc, dc2inc, turn (13 sts). Adult size only Next (inc): 1 ch (does not count as a st), dc2inc, 1 dc in next 11 dc, dc2inc, turn (15 sts). Next (inc): 1 ch (does not count as a st), dc2inc, 1 dc in next 13 dc, dc2inc, turn (17 sts). Both sizes Next: 1 ch (does not count as a st), work 1 dc in each dc, turn. Rep last row 5 more times. * Fasten off, leaving a long length of yarn at the end. the ear, 1 dc into each stitch down the edge of the next 12 rows. ** Fasten off. This will be the inner ear. To make the outer ear piece, with 6mm hook and A, make 2 ch. Rep from * to *. Do not fasten off. Change to 5mm hook and work from ** to ** to complete the ﬁrst row of edging, turn. Join ear pieces Place the two ear pieces together with the inner ear facing up. With 5mm hook and A, working into the stitches of the inner and outer ear pieces at the same time to join, make 1 ch, work 1 dc into each of the next 13 dc, dc2inc, 1 dc into each of the next 13 dc. Fasten off, leaving a length of yarn at the end. With 4.5mm hook and B, make 4 ch and sl st to ﬁrst ch to form a ring. Follow the muzzle pattern for the deer on page 46. Sew together the back seam of the hat. With right side of work facing, using 5mm hook and B, rejoin yarn to the back of the hat by the second earﬂap and follow the edging pattern as for the leopard hat on page 23. NOSE Both sizes With 4.5mm hook and C, make 2 ch. Row 1: Work 3 dc into second ch from hook, turn (3 sts). Row 2: 1 ch (does not count as a st), work 1 dc in each dc, turn. Row 3 (inc): 1 ch (does not count as a st), dc2inc, 1 dc, dc2inc, turn (5 sts). Push a thin layer of stuffing into the ears. With the length of yarn left after fastening off the edging, sew the lower edges of the inner and outer pieces together. Bring the two corners of each side from the lower edge of the ear to the middle to shape and stitch to hold in place. Sew the ears to the main section of the hat, stitching all around the lower edges to keep them securely in place. Adult size only Row 4 (inc): 1 ch (does not count as a st), dc2inc, 1 dc in next 3 dc, dc2inc, turn (7 sts). If making a crocheted lining, attach the twisted cords to the hat after inserting the lining. Weave in all the yarn ends. Place the small black buttons over the larger blue buttons and sew in place for the eyes. Make two twisted cords (see page 154) measuring 8in (20cm) long in A, using 6 strands of yarn. Make two 2[2⅜]in (5cm) pompoms (see page 155) in B and attach each to one end of the twisted cord, then stitch the other end of the cord to the tip of the earﬂap. Use the long length of yarn left after fastening off to stitch the muzzle to the front of the hat, positioning it just above the edging, leaving a small opening. Push some stuffing into the opening to shape the muzzle before stitching it down. Use the length of yarn after fastening off the nose to sew it in place just above the centre of the muzzle, with the wider edge at the top. bear This bear hat has a lovely cuddly quality using a combination of brushed and textured yarns in matching shades of brown. You could substitute brown for white to make a polar bear. Starting at the centre of the back of the ear, with 5.5mm hook and B, make 4 ch and sl st to ﬁrst ch to form a ring. Round 1: 1 ch (does not count as a st), work 5 dc into ring, sl st into ﬁrst dc (5 sts). Round 2 (inc): 1 ch (does not count as a st), (dc2inc) 5 times, sl st into ﬁrst dc (10 sts). Round 3 (inc): 1 ch (does not count as a st), (dc2inc, 1 dc) 5 times, sl st into ﬁrst dc (15 sts). Round 4 (inc): 1 ch (does not count as a st), (dc2inc, 2 dc) 5 times, sl st into ﬁrst dc (20 sts). Round 5 (inc): 1 ch (does not count as a st), (dc2inc, 3 dc) 5 times, sl st into ﬁrst dc (25 sts). Round 6 (inc): 1 ch (does not count as a st), (dc2inc, 4 dc) 5 times, sl st into ﬁrst dc (30 sts). Edging With 4.5mm hook and A, follow edging pattern for the earﬂap facing on page 18. Next (inc): 1 ch (does not count as a st), (dc2inc, 5 dc) 5 times, sl st into ﬁrst dc (35 sts). Next (dec): 1 ch (does not count as a st), (dc2dec, 5 dc) 5 times, sl st into ﬁrst dc (30 sts). Next: 1 ch (does not count as a st), work 1 dc in each dc, sl st into ﬁrst dc. Next: Rep last round 2 more times. Join in and continue in yarn A. Next (dec): 1 ch (does not count as a st), (dc2dec, 1 dc) 10 times, sl st into ﬁrst dc (20 sts). Next (dec): 1 ch (does not count as a st), (dc2dec) 10 times, sl st into ﬁrst dc (10 sts). Finishing at the centre front of the inner ear, fasten off, leaving a long length of yarn at the end. Inner ear Next: 1 ch (does not count as a st), work 1 dc in each dc, sl st into ﬁrst dc. MUZZLE Both sizes With 5.5mm hook and A, make 4 ch and sl st to ﬁrst ch to form a ring. Round 1: 1 ch (does not count as a st), work 6 dc into ring, sl st into ﬁrst dc (6 sts). Round 2 (inc): 1 ch (does not count as a st), (dc2inc) 6 times, sl st into ﬁrst dc (12 sts). Round 3 (inc): 1 ch (does not count as a st), (dc2inc, 1 dc) 6 times, sl st into ﬁrst dc (18 sts). Round 4 (inc): 1 ch (does not count as a st), (dc2inc, 2 dc) 6 times, sl st into ﬁrst dc (24 sts). Child size only Next: 1 ch (does not count as a st), work 1 dc in each dc, sl st into ﬁrst dc. Both sizes Next: 1 ch (does not count as a st), (dc2inc, 3 dc) 6 times, sl st into ﬁrst dc (30 sts). Next: 1 ch (does not count as a st), work 1 dc in each dc, sl st into ﬁrst dc. Adult size only Next: 1 ch (does not count as a st), (dc2inc, 4 dc) 6 times, sl st into ﬁrst dc (36 sts). Next: 1 ch (does not count as a st), work 1 dc in each dc, sl st into ﬁrst dc. Fasten off, leaving a long length of yarn at the end. With 4.5mm hook and C, make 4 ch and sl st to ﬁrst ch to form a ring. Round 1: 1 ch (does not count as a st), work 6 dc into ring, sl st into ﬁrst dc (6 sts). Round 2 (inc): 1 ch (does not count as a st), (dc2inc) 6 times, sl st into ﬁrst dc (12 sts). Adult size only Next: 1 ch (does not count as a st), (dc2inc, 1 dc) 6 times, sl st into ﬁrst dc (18 sts). Next: 1 ch (does not count as a st), work 1 dc in each dc, sl st into ﬁrst dc. Next: Rep last round once more. Adult size only Next (dec): 1 ch (does not count as a st), (dc2dec, 1 dc) 6 times, sl st into ﬁrst dc (12 sts). Both sizes Next: 1 ch (does not count as a st), work 1 dc in each dc, sl st into ﬁrst dc. Fasten off, leaving a long length of yarn at the end. MAKING UP Edging With right side of work facing, using 4.5mm hook and A, rejoin yarn to the back of the hat by the second earﬂap and follow the edging pattern as for the leopard hat on page 23.
close the opening before securing with a few stitches worked over each other. To shape the ear, fold it in half with yarn B on the outside and sew a few stitches, around 1[1½]in (2.5cm) from the lower edge of the fold, to hold the shaping in place. Push the excess of the curve at the folded end at the back of the ear, up inside the ear shaping (see 1) so it forms an even lower edge and stitch to hold in place (see 2). Sew the ears to the top of the hat, stitching all around the lower edges to hold them ﬁrmly in position. Muzzle and nose Use the long length of yarn left after fastening off to stitch the muzzle to the front of the hat, positioning it just above the edging, leaving a small opening. Push some stuffing into the opening to shape the muzzle before stitching it down. Weave the length of yarn left after fastening off the nose through the last round of stitches. Pull the yarn to gather the opening and stitch securely. This will produce a ﬂattened, round button-shaped nose. Sew the nose in place, just above the centre of the muzzle. Finishing touches If making a crocheted lining, attach the twisted cords to the hat after inserting the lining. Place the small black buttons over the larger brown buttons and sew in place for the eyes. Weave in all the yarn ends. Make two twisted cords (see page 154) using A, each measuring 8in (20cm) long, using 6 strands of yarn. Make two 2[2⅜]in (5cm) pompoms (see page 155) in B and attach each to one end of the twisted cord, then stitch the other end of the cord to the tip of the earﬂap. pig Itâ&#x20AC;&#x2122;s a classic pink pig! For a variation on this style, crocheted in a uniform colour, you could substitute one ball of yarn for a lighter or darker shade of pink to finish the edging, cords and tassels. TENSION 13 sts and 14 rows to 4in (10cm) over double crochet on 5mm hook. Use larger or smaller hook if necessary to obtain correct tension. METHOD OD The ears, sn snout nou out an and nd ma m main in part of the e pig hat are wo work rked rk ed iin n rounds of double le worked crochet. The e ears are ligh gh htl t y stuffed an nd lightly and attached to o the hat. The ﬂatt ttened shape tt sha h pe attened of the snoutt is formed by croc cheting ng g into crocheting just the back lo lloops ops of the stitc chess at stitches the beginning an aand d end ro ows w o the side rows off th edges. Butto ons n are e sstitched t tched an ti and pulled Buttons into the sno out u to shap a e it ffurther urther after snout shape stuffing tthe he piece. Button on n eyes, twisted cords an and tassels ﬁnish h the the h hat. Starting S tarting at the top of the hat, with 5mm hook an and A, follow the pattern for the leopa leopard hat main piece on page 14. Starting at the top of the ear, with 5mm hook and A, make 4 ch and sl st to ﬁrst ch to form a ring. Round 1: 1 ch (does not count as a st), work 6 dc into ring, sl st into ﬁrst dc (6 sts). Round 2 (inc): 1 ch (does not count as a st), (dc2inc) 6 times, sl st into ﬁrst dc (12 sts). Round 3: 1 ch (does not count as a st), work 1 dc in each dc, sl st into ﬁrst dc. Round 4 (inc): 1 ch (does not count as a st), (dc2inc, 1 dc) 6 times, sl st into ﬁrst dc (18 sts). Both sizes With 5mm hook and A, follow the earﬂap facing pattern as for the leopard hat on page 18. Edging With 4mm hook and A, follow edging pattern for the earﬂap facing on page 18. Round 5 (inc): 1 ch (does not count as a st), (dc2inc, 3 dc) 5 times, sl st into ﬁrst dc (25 sts). Adult size only Next (inc): 1 ch (does not count as a st), (dc2inc, 4 dc) 5 times, sl st into ﬁrst dc (30 sts). Both sizes Next: 1 ch (does not count as a st), work 1 dc into the back loop only of each dc, sl st into ﬁrst dc. This will help to keep the front of the snout ﬂat. Next: 1 ch (does not count as a st), work 1 dc in each dc, sl st into ﬁrst dc. Rep last round 1 more times. Next: 1 ch (does not count as a st), work 1 dc into the back loop only of each dc, sl st into ﬁrst dc. Adult size only Round 5 (inc): 1 ch (does not count as a st), (dc2inc, 2 dc) 6 times, sl st into ﬁrst dc (24 sts). Round 6 (inc): 1 ch (does not count as a st), (dc2inc, 3 dc) 6 times, sl st into ﬁrst dc (30 sts). Both sizes Next: 1 ch (does not count as a st), work 1 dc in each dc, sl st into ﬁrst dc. Rep last round 5 more times. Fasten off, leaving a long length of yarn at the end. Next (dec): 1 ch (does not count as a st), (dc2dec, 4 dc) 5 times, sl st into ﬁrst dc (25 sts). SNOUT Both sizes Starting at the centre of the snout, with 5mm hook and A, make 4 ch and sl st to ﬁrst ch to form a ring. Round 1: 1 ch (does not count as a st), work 5 dc into ring, sl st into ﬁrst dc (5 sts). Round 2 (inc): 1 ch (does not count as a st), (dc2inc) 5 times, sl st into ﬁrst dc (10 sts). Round 3 (inc): 1 ch (does not count as a st), (dc2inc, 1 dc) 5 times, sl st into ﬁrst dc (15 sts). Round 4 (inc): 1 ch (does not count as a st), (dc2inc, 2 dc) 5 times, sl st into ﬁrst dc (20 sts). Both sizes Next (dec): 1 ch (does not count as a st), (dc2dec, 3 dc) 5 times, sl st into ﬁrst dc (20 sts). Next (dec): 1 ch (does not count as a st), (dc2dec, 2 dc) 5 times, sl st into ﬁrst dc (15 sts). Fasten off, leaving a long length of yarn at the end. MAKING UP Edging With right side of work facing, using 4mm hook and A, rejoin yarn to the back of the hat by the second earﬂap and follow the edging pattern as for the leopard hat on page 23.
of the hat, stitching all around the lower edges to prevent them from ﬂopping over. Snout Stuff the snout, keeping the front ﬂat. With the long length of yarn left at the end, run a line of stitches through the last round and pull the yarn to gather the stitches and close the opening before fastening off. Sew the small buttons to the snout, stitching right through to the back of the work and pulling tight on the thread to draw the nostrils in. Attach the snout to the main part of the hat at the centre front, positioning it just above the edging stitches. Finishing touches If making a crocheted lining, attach the twisted cords to the hat after inserting the lining. Weave in all yarn ends. Make two twisted cords (see page 154) measuring 8in (20cm) long in A, using 6 strands of yarn. Make two tassels (see page 155) measuring 4[5⅛]in (10cm) long in A, and attach each to one end of the cord, then stitch the other end of the cord to the tip of the earﬂap. Place the small black buttons over the larger white buttons and sew in place for the eyes. giraffe For this hat, the distinctive giraffe markings are made with crocheted polygon patches worked in various sizes, while the giant tassels at the end of the cords represent the giraffeâ&#x20AC;&#x2122;s tail. METHOD OD The majority off th the he hat is w worked orrke ked d in n double crochet e . Th The e no ose s is cr roc oche h ted he d crochet. nose crocheted using a smal lle lerr ho hook o to pr ok p oduce a de dens nser ns smaller produce denser fabric. The no ose and the h orn-like or ke nose horn-like ossicones are e all ﬁlled ﬁrmly with with toy toyy stuffing. A th hin i layer of stuffing n is also o thin pushed into th he ears, which ar re folded e the are at one corner to o shape the hem be he b fore e them before attaching them to o th he h at. The em a kings ar the hat. markings are polygon-sh hap aped ed d patches, cr croc o heted polygon-shaped crocheted in treble an and nd chain stitches aand nd sewn around tthe h hat to form the he he ep atterned patterned coat o off the giraffe. Starting aat the top of the hat, with 6mm hook and A A, follow the pattern for the leopard h hat main piece on page 14. Starting at the top of the ear, with 6mm hook and A, make 4 ch and sl st to ﬁrst ch to form a ring. Round 1: 1 ch (does not count as a st), work 6 dc into ring, sl st into ﬁrst dc (6 sts). Round 2: 1 ch (does not count as a st), work 1 dc in each dc, sl st into ﬁrst dc. Round 3 (inc): 1 ch (does not count as a st), (dc2inc) 6 times, sl st into ﬁrst dc (12 sts). Round 4: As round 2. Round 5 (inc): 1 ch (does not count as a st), (dc2inc, 1 dc) 6 times, sl st into ﬁrst dc (18 sts). Round 6: As round 2. Round 7 (inc): 1 ch (does not count as a st), (dc2inc, 2 dc) 6 times, sl st into ﬁrst dc (24 sts). Round 8: As round 2. EARFLAP FACINGS (MAKE 2) EARF Omit if you plan to add a crocheted lining. Both sizes Bo W 6mm hook and A, follow the earﬂap With facing pattern as for the leopard hat on page 18. Starting at the top of the ossicone, with 6mm hook and B, make 4 ch and sl st to ﬁrst ch to form a ring. Round 1: 1 ch (does not count as a st), work 5 dc into ring, sl st into ﬁrst dc (5 sts). Round 2 (inc): 1 ch (does not count as a st), (dc2inc) 5 times, sl st into ﬁrst dc (10 sts). Round 3: 1 ch (does not count as a st), work 1 dc in each dc, sl st into ﬁrst dc. Rep last round once[twice] more. JJoin in yarn A and change to 4.5mm hook. Next: As round 3. Rep last round 5 more times. Fasten off, leaving a long length of yarn A at the end. Next (inc): 1 ch (does not count as a st), (dc2inc, 3 dc) 6 times, sl st into ﬁrst dc (30 sts). Both sizes Next: As round 2. Rep last round 1 more times. Next (dec): 1 ch (does not count as a st), (dc2dec, 2 dc) 6 times, sl st into ﬁrst dc (18 sts). Fasten off, leaving a long length of yarn at the end. NOSE With 4.5mm hook and A, make 4 ch and join with a sl st to the ﬁrst ch to form a ring. Round 1: 1 ch (does not count as a st), work 6 dc into ring, sl st to ﬁrst dc (6 sts). Round 2 (inc): 1 ch (does not count as a st), (dc2inc) 6 times, sl st into ﬁrst dc (12 sts). Round 3 (inc): 1 ch (does not count as a st), (dc2inc, 1 dc) 6 times, sl st into ﬁrst dc (18 sts). Round 4 (inc): 1 ch (does not count as a st), (dc2inc, 2 dc) 6 times, sl st into ﬁrst dc (24 sts). Adult size only Next (inc): 1 ch (does not count as a st), (dc2inc, 3 dc) 6 times, sl st into ﬁrst dc (30 sts). Next round: 1 ch (does not count as a st), work 1 dc in each dc, sl st to ﬁrst dc. Rep last round 5 more times. Fasten off, leaving a long length of yarn at the end. MARKINGS Tiny (make 5) Starting at the centre of the patch, with 3mm hook and C, make 4 ch and join with a sl st to the ﬁrst ch to form a ring. Next: 3 ch (to count as 1 tr), into ring work 2 tr, 2 ch, (3 tr, 2 ch) 4 times into ring, sl st into the third of 3 ch. Fasten off, leaving a long length of yarn at the end. Small (make 7) Starting at the centre of the patch, with 3mm hook and C, make 4 ch and join with a sl st to the ﬁrst ch to form a ring. Round 1: 3 ch (to count as 1 tr), into ring work 2 tr, 2 ch, (3 tr, 2 ch) 4 times into ring. Round 2: Work 1 dc into the third of 3 ch to join, work 1 dc into each of the next 2 tr, (2 dc, 2 ch, 2 dc) into next 2 ch sp, *1 dc into next 3 tr, (2 dc, 2 ch, 2 dc) into next 2 ch sp; rep from * 3 more times, sl st into ﬁrst dc. Fasten off, leaving a long length of yarn at the end. Starting at the centre of the patch, with 3mm hook and C, make 4 ch and join with a sl st to the ﬁrst ch to form a ring. Round 1: 3 ch (to count as 1 tr), into ring work 2 tr, 2 ch, (3 tr, 2 ch) 4 times into ring, sl st into third of 3 ch. Round 2: 2 ch (to count as ﬁrst htr), 1 htr into next 2 tr, (2 htr, 2 ch, 2 htr) into next 2 ch sp, *1 htr into next 3 tr, (2 htr, 2 ch, 2 htr) into next 2 ch sp; rep from * 3 more times, sl st into second of 2 ch. Fasten off, leaving a long length of yarn at the end. Starting at the centre of the patch, with 3mm hook and C, make 4 ch and join with a sl st to the ﬁrst ch to form a ring. Round 1: Work as for round 1 of medium marking. Round 2: 3 ch (to count as ﬁrst tr), 1 tr into next 2 tr, (2 tr, 2 ch, 2 tr) into next 2 ch sp, *1 tr into next 3 tr, (2 tr, 2 ch, 2 tr) into next 2 ch sp; rep from * 3 more times, sl st into third of 3 ch. Fasten off, leaving a long length of yarn at the end. Nose Stuff the nose lightly to pad it out, keeping a ﬂattened shape. Sew the 12 stitches from each side of the opening together to form a straight edge. Stitch the nose in place on the front of the hat with the straight edge sitting just above the second row of edging stitches. Using yarn C and a blunt-ended darning needle, embroider the nostrils by working two straight stitches (see page 155) for each. If making a crocheted lining, attach the twisted cords to the hat after inserting the lining. Place the small black buttons over the larger brown buttons and sew in place for the eyes. Arrange the markings on the front and back of the hat and sew them in place on the main section using the long lengths of yarn left after fastening off. Weave in all the yarn ends. Make two twisted cords (see page 154) using A, each measuring 8 in (20cm)] long, using 6 strands of yarn. Make two tassels (see page 155) measuring 4[5⅛]in (10cm) long in B, and attach each to one end of the twisted cord, then stitch the other end of the cord to the tip of the earﬂap. Ossicones and ears Stuff the ossicones ﬁrmly and attach them to the top of the hat, stitching all around the lower edge. Push a thin layer of stuffing into the ears, keeping the shape ﬂat. Using the long length of yarn left after fastening off the ear, sew together the 9 stitches from each side of the opening to join, forming a straight edge. Turn 1⅜in (3.5cm) over on one corner of the ﬁrst ear and stitch it down along the straight edge. Repeat with the other ear, folding it at the opposite corner so they mirror each other. Sew the ears in place with the folded edge at the top. owl Wide eyes are the stand-out feature of the owl hat. Tweed yarns echoing the natural hues of the landscape create additional detail and interest, providing colour and texture for this wise bird. METHOD The main part of tthe he h hat at is croc crocheted oche heted in rounds with the ear rﬂaps and facings fac a ings g in earﬂ rows of double croch c et. The wing ngs, e yes ye crochet. wings, eyes and beak use a sma aller hook. The he w ings in gs smaller wings are crocheted in croco codile stitch, whi h ch crocodile which forms the feather-like ke p attern ffor orr the pattern wings. The eyess ar are e work rked ed iin n roun nds worked rounds of double cr croc oche h t, half tr reb e le and ttreble r ble re crochet, treble stitches es. T he shaping ar round the he eyes stitches. The around is ccreated reat ated by working ﬁrstt into into the front loop lo ops of the stitche es. A second row is loops stitches. croc cr o heted and th then n the third is joined to crocheted the back loo th oops ps o loops off the ﬁrst row of stitches, forming g a ri ridg dge. e. T he beak is worked in ridge. The rounds off do doub uble l crochet and is folded in double half and stuffed. Tassels are added to the top of the hat, as well as at the end of the twisted cords. Start at the top of the hat, with 6mm Starting hook and A, follow the pattern for the leopa leopard hat main piece on page 14. EARFLAP FACINGS (MAKE 2) EAR Omit if you plan to add a crocheted lining. Both sizes With 6mm hook and A, follow the earﬂap facin facing pattern as for the leopard hat on page 18. Edging Edg With 5mm hook and A, follow edging patte pattern for the earﬂap facing on page 18. Starting at the tip of the wing, with 5mm hook and B, make 9 ch. Row 1: Work 1 tr into third ch from hook (counts as ﬁrst 2 tr), (2 ch, miss 2 ch, 2 tr into next ch) twice (3 sets of 2 tr). Row 2: 1 ch (does not count as a st), miss the ﬁrst set of 2 tr, work 5 tr down the post of the ﬁrst of the next 2 tr by taking the hook behind the stitch then back around to the front of the work, rather than into the top of the stitch as usual (see illustration), make 1 ch, work 5 tr up the post of the second of 2 tr, miss next set of 2 tr, sl st between last set of 2 tr (1 feather). Row 3: 3 ch (counts as ﬁrst tr), 1 tr between the 2 tr missed on previous row, 2 ch, 2 tr into space in the centre of the feather, 2 ch, 2 tr between the 2 tr missed on previous row (3 sets of 2 tr). Row 4: 1 ch (does not count as a st), work 5 tr down the post of the ﬁrst of 2 tr, 1 ch, work 5 tr up the post of the second of 2 tr, miss next set of 2 tr; work 5 tr down the post of the ﬁrst of the next 2 tr, 1 ch, work 5 tr up the post of the second of 2 tr (2 feathers). Row 5: 1 ch (does not count as a st), (2tr, 2ch, 2tr) into space in centre of ﬁrst feather, 2 ch, 2 tr between the 2 tr missed on previous row, 2ch, (2tr, 2ch, 2tr) into space in centre of next feather (5 sets of 2 tr). Row 6: 1 ch (does not count as a st), work 5 tr down the post of the ﬁrst of 2 tr, 1 ch, work 5 tr up the post of the second of 2 tr, (miss next set of 2 tr, work 5 tr down the post of the ﬁrst of the next set of 2 tr, 1 ch, work 5 tr up the post of the second of 2 tr) twice (3 feathers). Row 7: 1 ch (does not count as a st), 2 tr into space in centre of ﬁrst feather, *2 ch, (2tr, 2ch, 2tr) between the 2 tr missed on previous row, 2 ch, 2 tr into space in centre of next feather, rep from * once (7 sets of 2 tr). Row 8: 1 ch (does not count as a st), work 5 tr down the post of the ﬁrst of the 2 tr, 1 ch, work 5 tr up the post of the second of 2 tr, (miss next set of 2 tr, work 5 tr down the post of the ﬁrst of the next set of 2 tr, 1 ch, work 5 tr up the post of the second of 2 tr) 3 times (4 feathers). Row 9: 1 ch (does not count as a st), 2 tr into space in centre of ﬁrst feather, (2 ch, 2 tr between the 2 tr missed on previous row, 2 ch, 2 tr into space in centre of next feather) 3 times (7 sets of 2 tr). Row 10: As row 8. Row 11: As 9. Row 12: As 8. Row 13: As 9. Adult size only Next: As row 8. Next: As row 9. Shape top of wing Both sizes Next: 1 ch (does not count as a st), miss the ﬁrst set of 2 tr, (work 5 tr down the post of the ﬁrst of the next 2 tr, 1 ch, work 5 tr up the post of the second of 2 tr, miss next set of 2 tr) twice, work 5 tr down the post of the ﬁrst of the next 2 tr, 1 ch, work 5 tr up the post of the second of 2 tr, sl st between last set of 2 tr (3 feathers). Next: 1 ch (does not count as a st), 2 tr into space in centre of ﬁrst feather, (2 ch, 2tr between the 2 tr missed on previous row, 2 ch, 2 tr into space in centre of next feather) twice (5 sets of 2 tr). Next: 1 ch (does not count as a st), (miss the ﬁrst set of 2 tr, work 5 tr down the post of the ﬁrst of the next 2 tr, 1 ch, work 5 tr up the post of the second of 2 tr) twice, sl st between last set of 2 tr (2 feathers). Fasten off, leaving a long length of yarn at the end. EYES (MAKE 2) With 6mm hook and C, make 4 ch and sl st to ﬁrst ch to form a ring. Round 1 (RS): 1 ch (does not count as a st), work 6 dc into ring, sl st to ﬁrst dc (6 sts). Round 2 (inc): 3 ch (counts as ﬁrst tr), work 1 tr into the same st, (tr2inc) 5 times, sl st to third of 3 ch (12 sts). Round 3 (inc): 3 ch (counts as ﬁrst tr), 1 tr into the same st, (tr2inc) 11 times, sl st to third of 3 ch (24 sts). Round 4 (inc): 2 ch (counts as ﬁrst htr), 1 htr in same st, (1 htr, htr2inc) 11 times, 1 htr in next st, sl st to second of 2 ch (36 sts). Eye shaping Join in yarn A. Round 5: 1 ch (does not count as a st), work 1 dc in next 10 htr, 1 htr in the front loop only of the next 2 htr, work 1 tr in the front loop only of the next 22 htr, 1 htr in the front loop only of the next 2 htr, sl st to ﬁrst dc, turn. The following is worked in rows: Next (WS): 2 ch (counts as ďŹ rst htr), working into both loops of each st, work 1 htr in the next htr, 1 tr in the next 22 tr, 1 htr in the next 2 htr, turn. BEAK With 5mm hook and B, make 4 ch and join with a sl st to ﬁrst ch to form a ring. Round 1: 1 ch (does not count as a st), work 6 dc into the ring (6 sts). Round 2 (inc): 1 ch (does not count as a st), (dc2inc) 6 times, sl st to the ﬁrst dc (12 sts). Round 3 (inc): 1 ch (does not count as a st), (dc2inc, 1 dc) 6 times, sl st to the ﬁrst dc (18 sts). Sl st to next st and fasten off, leaving a long length of yarn. With right side of work facing, using 5mm hook and A, rejoin yarn to the back of the hat by the second ear ﬂap and follow the edging pattern as for the leopard hat on page 23. If making a crocheted lining, attach the wings and twisted cords to the earﬂaps after inserting the lining. Press the wings with a cool iron. Position each wing over the earﬂaps and sew in place using yarn left after fastening off. Join the eyes by sewing together a few stitches so the start of the raised lip is in the centre between the eyes and the other end is in line with the lower edge. Position the crocheted eyes just above the edging on the front of the hat and attach with the length of yarn left after fastening off. Sew around the last round of double crochet stitches so that the ridge stands away from the main part of the hat. Stitch the eyes down at the lower edge where there is no ridge. Place the small black buttons over the larger orange or yellow buttons and sew onto the crocheted circles to ﬁnish the eyes. Weave in all the yarn ends. Make two twisted cords (see page 154) using A, each measuring 8in (20cm) long, using 6 strands of yarn. Make two tassels (see page 155) measuring 4[5⅛] in (10cm) long in C, and attach each to one end of the twisted cord, then stitch the other end of the cord to the tip of the earﬂap. Make two tassels measuring 3 in (7.5cm) long in A. Sew to each side of the top of the hat. Fold the crocheted circular piece in half. With the length of yarn left after fastening off, stitch the curved edges together, leaving a small opening. Push a little stuffing through the opening to ﬁll the beak before stitching closed. Sew the beak in place in between the eyes with the curved side facing out, stitching all around it to secure it in position. rabbit The fleecy yarn creates a lovely furry rabbit, making this hat really cosy. It is quite difficult to see the stitches through the â&#x20AC;&#x2DC;furâ&#x20AC;&#x2122;, but holding it up to a light or window will help. TENSION 13 sts and 14 rows to 4in (10cm) over double crochet on 4.5mm hook. Use larger or smaller hook if necessary to obtain correct tension. Th The he main p piece, ie ece ce, ch ccheeks ee eks k aand nd n nose o e are os e all w wo rked d iin n rounds dss of double croch he ett. The worked crochet. inne ne er and oute er pa p rts of the h ears are inner outer parts ccrocheted cr ocheted in rrows owss an ow aand d st stit i ched togethe er stitched together before attachi ing n tthem hem he m to tthe he hat. Twis sted attaching Twisted cords and ﬂuff uffyy pompoms provide pro ovi v de the touche es. ﬁnishing touches. Omitt iiff you plan to add a crocheted lining. Both Bo t size th sizes With 4.5m 4.5mm hook and A, follow the earﬂap fa facing pattern as for the leopard hat on pa page 18. Edging With 3.5 3.5mm hook and B, follow edging pattern for the earﬂap facing on page 18. EARS (MAKE 2) Both sizes With 4.5mm hook and A, make 2 ch. Row 1 (RS): Work 3 dc into second ch from hook, turn (3 sts). Row 2 (inc): 1 ch (does not count as a st), dc2inc, 1 dc, dc2inc, turn (5 sts). Row 3: 1 ch (does not count as a st), work 1 dc in each dc, turn. Row 4 (inc): 1 ch (does not count as a st), dc2inc, 1 dc in next 3 dc, dc2inc, turn (7 sts). Row 5: 1 ch (does not count as a st), work 1 dc in each dc, turn. Row 6 (inc): 1 ch (does not count as a st), dc2inc, 1 dc in next 5 dc, dc2inc, turn (9 sts). Row 7: 1 ch (does not count as a st), work 1 dc in each dc, turn. Row 8 (inc): 1 ch (does not count as a st), dc2inc, 1 dc in next 7 dc, dc2inc, turn (11 sts). Row 9: 1 ch (does not count as a st), work 1 dc in each dc, turn. Row 10 (inc): 1 ch (does not count as a st), dc2inc, 1 dc in next 9 dc, dc2inc, turn (13 sts). Adult size only Next: 1 ch (does not count as a st), work 1 dc in each dc, turn. Next (inc): 1 ch (does not count as a st), dc2inc, 1 dc in next 11 dc, dc2inc, turn (15 sts). Next: 1 ch (does not count as a st), work 1 dc in each dc, turn. Next (inc): 1 ch (does not count as a st), dc2inc, 1 dc in next 13 dc, dc2inc, turn (17 sts). Both sizes Next: 1 ch (does not count as a st), work 1 dc in each dc, turn. Rep last row 10 more times. Fasten off, leaving a long length of yarn at the end. INNER EARS (MAKE 2) Both sizes With 4.5mm hook and B, make 2 ch. Row 1 (RS): Work 3 dc into second ch from hook, turn (3 sts). Row 2 (inc): 1 ch (does not count as a st), dc2inc, 1 dc, dc2inc, turn (5 sts). Rows 3–4: 1 ch (does not count as a st), work 1 dc in each dc, turn. Row 5 (inc): 1 ch (does not count as a st), dc2inc, 1 dc in next 3 dc, dc2inc, turn (7 sts). Rows 6–7: 1 ch (does not count as a st), work 1 dc in each dc, turn. Row 8 (inc): 1 ch (does not count as a st), dc2inc, 1 dc in next 5 dc, dc2inc, turn (9 sts). Rows 9–10: 1 ch (does not count as a st), work 1 dc in each dc, turn. With 3mm hook and D, make 4 ch and sl st to ﬁrst ch to form a ring. Round 1: 1 ch (does not count as a st), work 6 dc into ring, sl st into ﬁrst dc (6 sts). Round 2: 1 ch (does not count as a st), work 1 dc in each dc, sl st to ﬁrst dc. Round 3 (inc): 1 ch (does not count as a st), (dc2inc) 6 times, sl st into ﬁrst dc (12 sts). Round 4: As round 2. Adult size only Round 4 (inc): 1 ch (does not count as a st), (dc2inc, 2 dc) 6 times, sl st into ﬁrst dc (24 sts). Fasten off, leaving a long length of yarn at the end. Next (inc): 1 ch (does not count as a st), (dc2inc, 1 dc) 6 times, sl st into ﬁrst dc (18 sts). Next: As round 2. Both sizes Sl st to next st and fasten off, leaving a long length of yarn at the end. With right side of work facing, using 3.5mm hook and B, rejoin yarn to the back of the hat by the second earﬂap and follow the edging pattern as for the leopard hat on page 23. Flatten the nose and sew the 6 stitches from each side of the top edge together to form a triangular shape. With the stitched edge at the top, sew the nose to centre front of hat, in between the top shaping of the cheeks. With RS together sew the inner to the outer ear, leaving lower edge open. Turn RS out, positioning the inner ear so it sits centrally with a slight overlap each side of the larger outer piece. Join the lower edges. Bring the two corners of each side from the lower edge of the ear to the middle to shape. Stitch to hold in place. Attach to the main section of the hat. If making a crocheted lining, attach the twisted cords to the hat after inserting the lining. Weave in all the yarn ends. Make two twisted cords (see page 154) measuring 8in (20cm) long in A, using 6 strands of yarn. Make two 2[2⅜]in (5cm) pompoms (see page 155) in C and attach each to one end of the twisted cord, then stitch the other end of the cord to the tip of the earﬂap. Place the small black buttons over the larger white buttons and sew in place for the eyes. Cheeks Sew the cheeks to the face, around ⅝in (1.5cm) from the lower edge, setting them close together. sewing in a fleece lining Choose a stretch fabric that feels soft to the touch to line your animal hat and make it even cosier. 1 Scale the pattern template to size, transferring all the markings onto the paper. Cut out the pattern, following the continuous line. Seam allowances of ⅝in (1.5cm) are included in the pattern. Place the pattern on the folded ﬂeece, ensuring the fold indicated on the pattern is placed exactly on the fold of the fabric. Pin the pattern in position and cut out the fabric. 3 Turn under a hem of ⅝in (1.5cm) and pin to the inside of the hat, just above the crocheted edging or the ribbed pattern, with the main seam of the lining at the centre back of the hat. Ease the fabric evenly around the lower edge. Slip stitch in place by hand. Work a few stitches through the top of the crown into the crocheted hat to keep the lining in place. 2 Stitch the darts indicated on the pattern template. Cut to within ½in (1.25cm) of the point of the dart and press open. With right sides together, pin and stitch the main seam, allowing a ⅝in (1.5cm) seam. Trim the seam and cut notches in the curve, taking care not to cut into the stitching. crocheted lining Use the same yarn and hook as for the main part of the hat you are making to crochet a cosy lining in a matching or contrasting colour. As earﬂap facings are worked into the crocheted lining, omit them from the main animal hat pattern. Attach the lining after adding the features of the animal and before stitching the twisted cords to the earﬂaps. If making an owl or parrot hat, sew on the wings after attaching the lining. Starting at the top of the hat, with speciﬁed hook and yarn, follow the pattern for the leopard hat main piece on page 14 to the end of round 10. Next: 1 ch (does not count as a st), work 1 dc in each dc, sl st into ﬁrst dc. Frog hat only Next: Rep last round 10 times more. Fasten off, leaving a long length of yarn. Follow the ﬁrst 21 rounds of the chart for the leopard hat on page 14. Duck hat only Next: Rep last round 12 times more. Fasten off, leaving a long length of yarn. Follow the ﬁrst 23 rounds of the chart for the leopard hat on page 14. Making up With right sides together, matching the centre back, slip the lining inside the hat so the lower edge of it is just above the ribbing. Thread the length of yarn left after fastening off onto a blunt-ended darning needle and sew the lining into the hat, stitching all around the lower edge. Work a few stitches through the top of the hat to hold the lining in place. FOR ALL HATS WITH EARFLAPS Starting at the top of the hat, with speciﬁed hook and yarn, follow the pattern and charts for the leopard hat main piece and earﬂaps on pages 14–16. Follow the chart for the leopard hat on page 14. MAKING UP Edging With right side of work facing, using the speciﬁed hook and yarn used for the edging, rejoin the yarn to the back of the hat by the second earﬂap and follow the ﬁrst round of the edging pattern as for the leopard hat on page 23. Next: With wrong sides together, slip the lining inside the main piece and work 1 ch (does not count as a st). Working into the stitches of both the main piece and lining at the same time to join, work 1 dc in each of the 10 dc across the back of the hat, ***work 1 dc into each of the next 10 dc down one side of the earﬂap, dc2inc, 1 dc into next dc, dc2inc, 1 dc into each of the next 10 dc up the other side of the earﬂap***, work 1 dc into each of the next 24 dc across the front of the hat, rep from *** to *** to ﬁnish the edging of the second earﬂap (84 sts). Sl st to next st and fasten off. Weave in the ends. The ﬁnished animal hats are intended to ﬁt children up to 20in (51cm) head circumference, and adults up to 22in (56cm) head circumference. Measure the tension of the rows by placing a ruler vertically over the work and mark 4in (10cm) with pins. Count the number of rows between the pins. If the number of stitches and rows is greater than those stated in the pattern, your tension is tighter and you should use a larger hook. If the number of stitches and rows is fewer than those stated in the pattern, your tension is looser, so you should use a smaller hook. Checking the tension before starting a project is vital, since this will affect the size and look of the ﬁnished piece. The tension is the number of rows and stitches per square inch or centimetre of crocheted fabric. Using the same size hook and type of stitch as in the pattern, work a sample of around 5in (12.5cm) and then smooth it out on a ﬂat surface. Place a ruler horizontally across the work and mark 4in (10cm) with pins. Count the number of stitches between the pins, including half stitches. This will give you the tension of the stitches. Sizes vary widely, from tiny hooks that produce a very ﬁne stitch when used with threads to oversized hooks for working with several strands of yarn at one time to create a bulky fabric. Using a larger or smaller hook will change the look of the fabric and will also affect the tension and the amount of yarn required. A blunt-ended darning or tapestry needle is used to sew the projects together. The rounded end will prevent any snagging and the large eye makes it easy to thread the needle with the thick yarns. Hold the hook as you would a pencil, bringing your middle ﬁnger forwards to rest near the tip of the hook. This will help control the movement of the hook, while the ﬁngers of your other hand will regulate the tension of the yarn. The hook should face you, pointing slightly downwards. The motion of the hook and yarn should be free and even, not tight. This will come with practice. SUBSTITUTING YARNS When substituting yarns, it is important to calculate the number of balls required by the number of yards or meters per ball rather than the weight of the yarn because this varies according to the ﬁbre. Tension is also important. Always work a tension swatch in the yarn you wish to use before starting a project. READING PATTERNS The animal-hat patterns are written for children’s and adults’ sizes. The children’s size is given ﬁrst and where the adults’ instructions differ, the adjustment is given inside the square brackets [ ]. If 0 appears in the instructions, then no stitches or rows are to be worked for this size. Where there is no bracket after the stitches or rows given, the instructions refer to both sizes. Take the end of the yarn and form it into a ring. Holding it in place between thumb and foreﬁnger, insert the hook through the ring, catch the long end that is attached to the ball, and draw it back through. Keeping the yarn looped on the hook, pull through until the loop closes around the hook, ensuring it is not tight. Pulling on the short end of yarn will loosen the knot; pulling on the long end will tighten it. To hold your work and control the tension, pass the yarn over the ﬁrst two ﬁngers of your left hand (right if you are left-handed), under the third ﬁnger and around the little ﬁnger, and let the yarn fall loosely to the ball. As you work, take the stitch you made between the thumb and foreﬁnger of the same hand. The hook is usually inserted through the top two loops of a stitch as you work, unless otherwise stated in a pattern. A different effect is produced when only the back loop of the stitch is picked up. READING CHARTS Each symbol on a chart represents a stitch; every round or horizontal row represents one round or row of crochet. For rounds of crochet, read the chart counterclockwise, starting at the centre and working out to the last round on the chart. crochet stitches Here is all the basic information you need to crochet your animal hat. A simple slip knot (see page 149) is the starting point for the various stitches that you will use. 1 Pass the hook under and over the yarn that is held taught between the ﬁrst and second ﬁngers. This is called ‘yarn round hook’ (yrh). Draw the yarn through the loop on the hook. This makes one chain (ch). Make a practice chain of 10. Insert hook into ﬁrst stitch, yrh, draw through both loops on hook. This forms 1 sl st. Continue to the end. This will give you 10 slip stitches (10 sts). 2 Repeat step 1, keeping the thumb and foreﬁnger of the left hand close to the hook, until you have as many chain stitches as required. 1 Make a practice chain of 17. Miss the ﬁrst chain. Insert hook from front into the next stitch, yarn round hook and draw back through the stitch (2 loops on hook). Turn the work so the reverse side faces you. Make 1 chain (ch). This is the turning chain, which helps keep a neat edge and does not count as a stitch. Rep steps 1 and 2 to the end of the row. Continue until the desired number of rows is complete. Fasten off. 1 Make a practice chain of 17. Miss the ﬁrst 2 chain stitches (these count as the ﬁrst half treble stitch). Yarn round hook (yrh), insert hook into the next st, yarn round hook and draw back through stitch (3 loops on hook). 2 Yarn round hook and draw through 2 loops (1 loop on hook). This makes one double crochet. Repeat steps 1 and 2 to end. On the foundation chain of 17 sts you should have 16 double crochet stitches (16 sts). FASTENING OFF When you have ﬁnished, fasten off by cutting the yarn around 4¾in (12cm) from the work. Draw the loose end through the remaining loop, pulling it tightly. 2 Yarn round hook, draw through all 3 loops (1 loop on hook). This forms 1 half treble (htr). Repeat steps 1 and 2 to the end of the row. On the foundation chain of 17 sts you should have 16 half trebles (16 sts), including the 2 ch at the beginning of the row, which is counted as the ﬁrst stitch. Next row Turn the work so the reverse side faces you. Make 2 ch to count as the ﬁrst half treble. Miss the ﬁrst stitch of the previous row. Repeat steps 1 and 2 for the next 14 htr of the last row, work 1 htr in the second of the 2 ch at the end of the row. Continue until the desired number of rows is complete. Fasten off. 1 Make a practice chain of 18. Miss the ﬁrst 3 chain stitches (these count as the ﬁrst treble stitch). Yarn round hook (yrh), insert hook into the next st, yarn round hook and draw back through stitch (3 loops on hook). To increase one double crochet (dc2inc), half treble (htr2inc) or treble stitch (tr2inc), work two stitches into one stitch of the previous row. 2 Yarn round hook, draw through 2 loops (2 loops on hook). 3 Yarn round hook, draw through 2 loops (1 loop on hook). This forms 1 treble (tr). Repeat steps 1–3 to end of row. On the foundation chain of 18 sts you should have 16 trebles (16 sts), including the 3 ch at the beginning of the row, counted as the ﬁrst stitch. Next row Turn the work so the reverse side faces you. Make 3 ch to count as the ﬁrst treble. Miss the ﬁrst stitch of the previous row. Repeat steps 1–3 to the end of the row, working 1 tr into the third of the 3 ch at the beginning of the last row. Continue until the desired number of rows is complete. Fasten off. To decrease one double crochet (dc2dec), insert the hook into the next stitch, yarn round hook and draw back through the stitch (2 loops on hook); insert the hook into the following stitch, yarn round hook and draw back through the stitch (3 loops on hook), yarn round hook and draw through all three loops on the hook. JOINING IN COLOURS At the beginning of a round or row When joining in a new colour at the beginning of a round or row, catch the yarn in the new colour and draw through the stitch. Work the ﬁrst stitch in the new colour into the same place as the join. In the middle of a row 1 When joining in a new colour in the middle of a row, it is worked into the stitch preceding the one that the new shade is to start. To join in the new colour, insert hook in next stitch, yarn round hook in the ﬁrst colour, draw back through the stitch (2 loops on hook), yarn round hook with the new colour, draw through both loops on hook. Continue in the new colour. 2 The colour that is not in use can be carried across the back of the work and hidden along the line of stitches being made using the contrast colour, keeping the crocheted fabric neat so either side of the ﬁnished work can be used. This method is used at the beginning of the face shaping for the husky hat on page 96. Alternatively, several small balls of yarn can be wound beforehand to use separately for each block of colour, as in the tiger hat on page 85. 1 Measure 6 strands of around ⅞[1⅓]yd (0.8[1.2]m) lengths of yarn. This will give you extra length to sew and weave the ends into the earﬂaps. Knot the ends of the yarn together. Slip one end over a coat hook and insert a pencil into the other end. Hold the pencil between the thumb and foreﬁnger, keeping the yarn taut. Turn the pencil clockwise to twist the strands. 2 Continue turning the pencil until the strands are tightly twisted. Fold them, allowing the two halves to twist together naturally. Remove the pencil and carefully undo the knots. With a strand threaded onto a needle, wind the yarn around the cord near the top and secure with a few stitches. Alternatively, the end can be knotted but it will be bulkier. the other loop. Hold the pencil between the thumb and foreﬁnger, keeping the yarn taut. The point where the yarn is intertwined should be in the middle. 2 Turn the pencil clockwise until the strands are tightly twisted. Fold them in the middle, where the two colours meet, and allow them to twist together naturally, producing a striped effect. Finish as for the twisted cord. 1 Cut two circles of card to the required measurement for each pompom. Make a hole in the centre of each circle. The hole should be around a third of the size of the ﬁnished pompom. Thread a blunt needle with a long length of doubled yarn and, with the two circles of card together, wind the yarn through the hole and around the outer edge of the circle. Continue in this way, using new lengths of yarn, until the hole is ﬁlled and the circle is covered. 1 Cut a piece of card to the required length of the ﬁnished tassel. Wind the yarn around the card to the desired thickness. Break yarn, leaving a long length, and thread it through a needle. Slip the needle through all the loops on the card and tie the yarn tightly at the top edge. These simple stitches are used to add features to the sheep, zebra and giraffe hats on pages 48, 68 and 114. 2 Cut through the yarn around the outer edge between the two circles of card. Tie a length of yarn securely around the middle, leaving long ends to attach the pompoms to the twisted cords. Remove the card and trim the pompom, ﬂuffing it into shape. 2 Remove the card and wind the yarn around the loops, a little way down from the tied top end, securing with a few stitches and drawing the needle through to the top to leave an end to stitch to the cord. Cut through the folded lower edge and trim to neaten the ends. Fly stitch 1 Bring the yarn through to the front of the work on the left side of the centre of the stitch and hold it down with your left thumb. Insert the needle to the right, in line with the point where it ﬁrst emerged. Bring the needle back through to the front of the work and a little way down, in line with the centre of the stitch, keeping the yarn under the needle. 2 Insert the needle back into the work to form a V shape with the stitch. Insert the needle lower down, forming a straight line below the V-shaped stitch. This is a single stitch that can be worked in varying lengths. It is useful for embroidering short lines. Vanessa Mooncie is a contemporary crochet jewellery designer and maker, silkscreen artist and illustrator. She spent many happy hours as a child learning to crochet and knit with her mother and grandmother. She went on to study fashion and textile design, then became a children’s wear designer, illustrator and commercial interior designer. She lives with her family in the English countryside. I would like to thank Wendy McAngus and all at GMC. 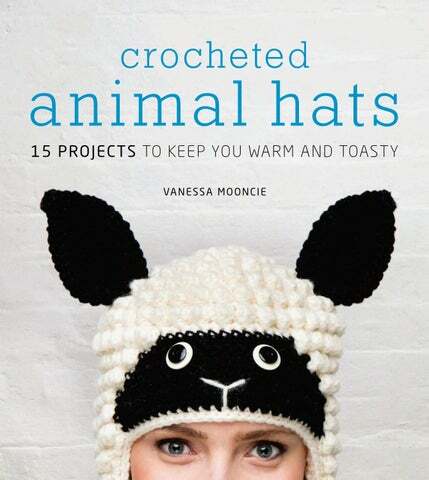 Thank you very much to Jonathan Bailey for giving me the opportunity to write Crocheted Animal Hats. For their continuous support and encouragement, I thank my husband Damian, my children Miriam, Dilys, Flynn and Honey, and my granddaughter Dolly, who have all very kindly and patiently modelled the hats for me as I made them. GMC would like to thank the following people for their help in creating this book: Chris Gloag for photography, Tiffany from Zone Models, Jen Dodson for hair and make-up, Amelia Holmwood for styling, and Anthony Bailey for still-life shots.